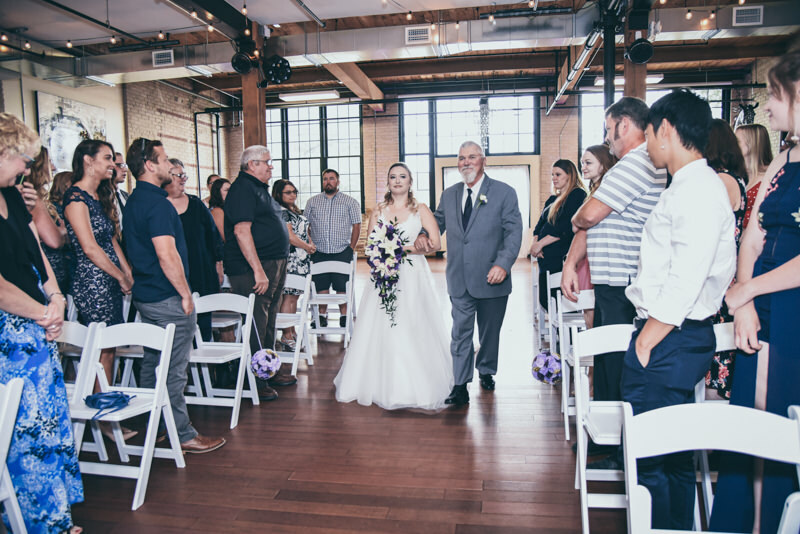 This was a special event! 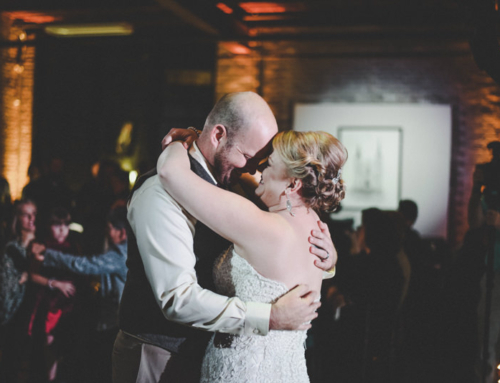 (We love the emotional ones)! 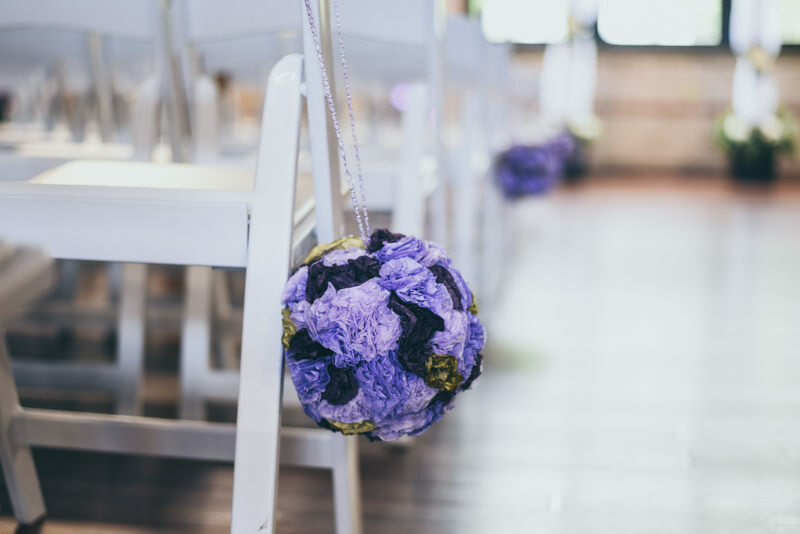 Claire and Geoff must have had a good idea of how things would go, because they made sure to have a basket of tissues available for the guests. 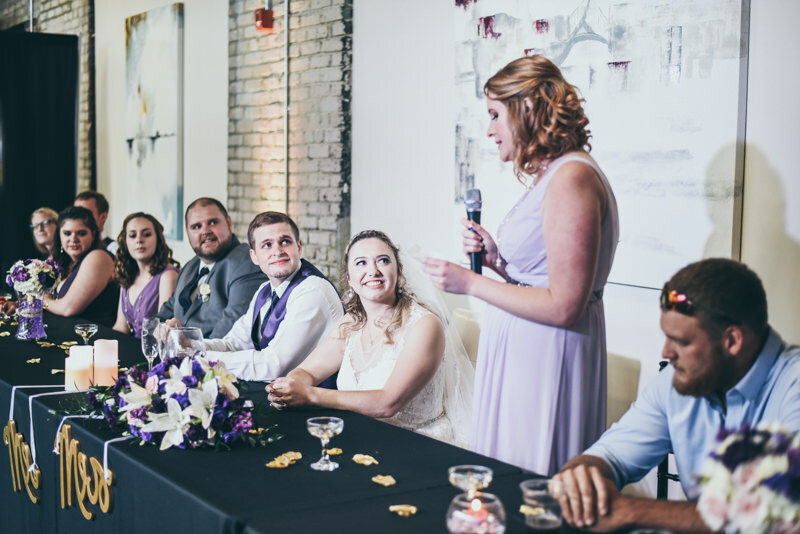 Everyone was so happy to be there, and Claire’s aunt even flew from Ireland to make sure she was able to share this day with them. 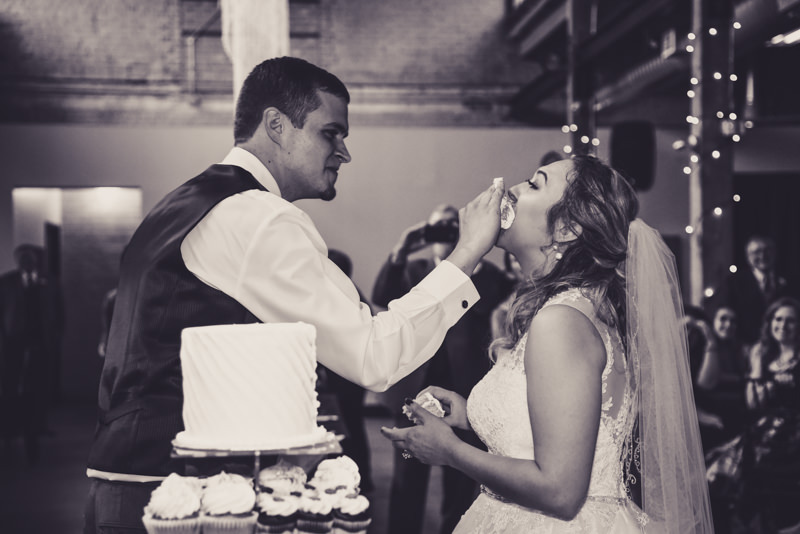 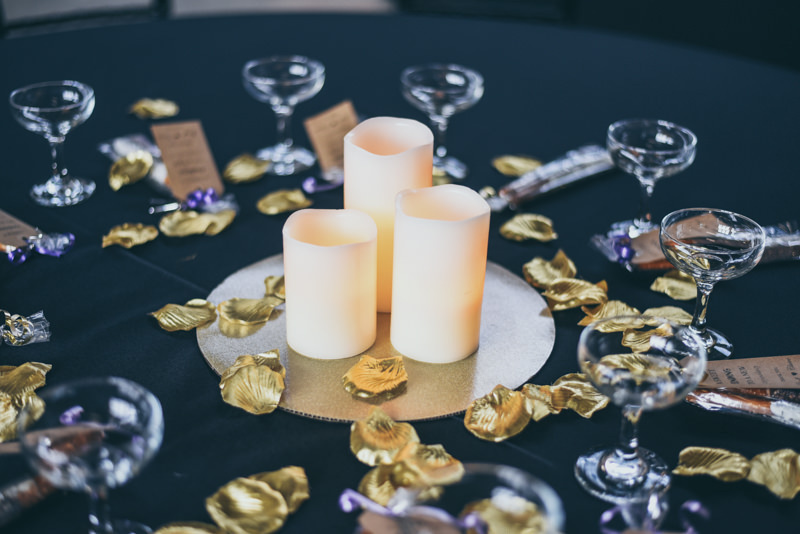 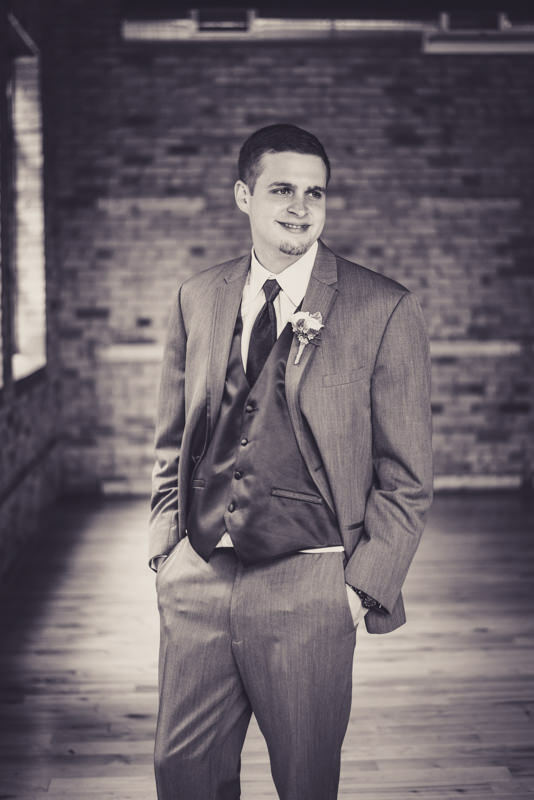 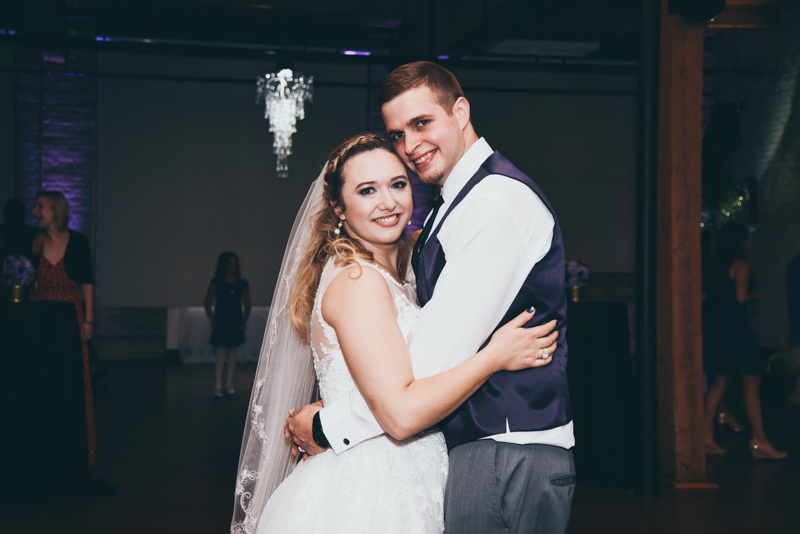 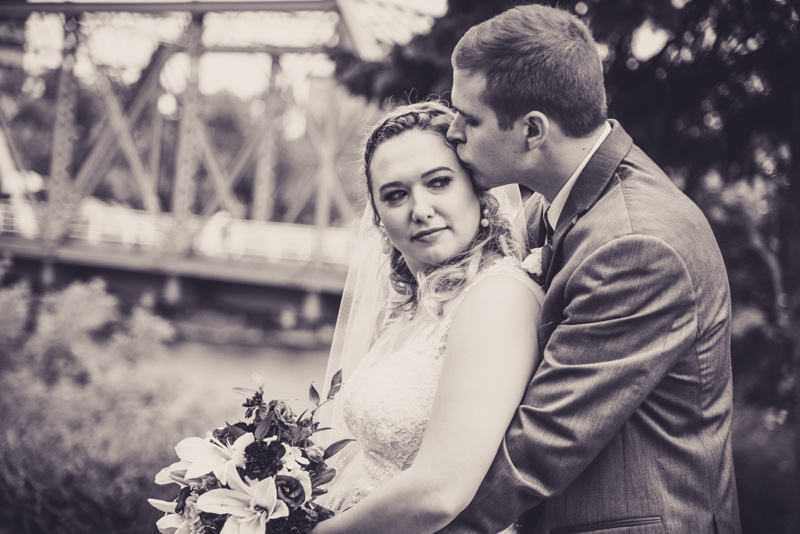 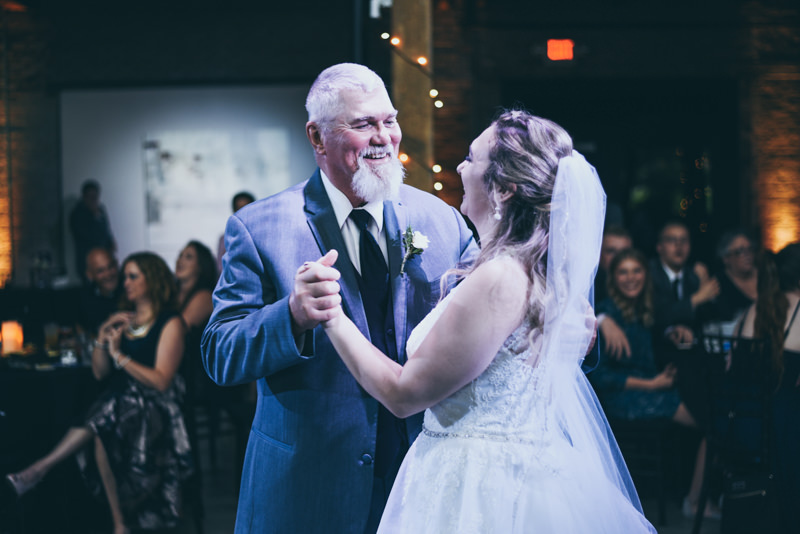 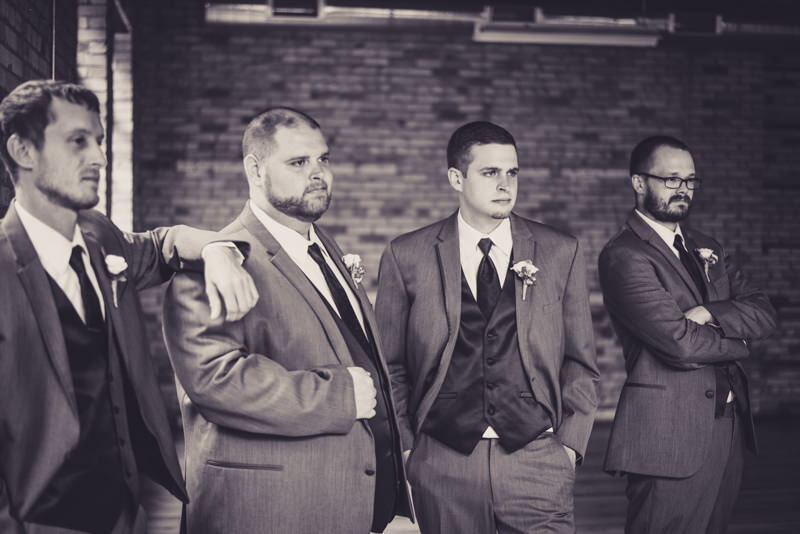 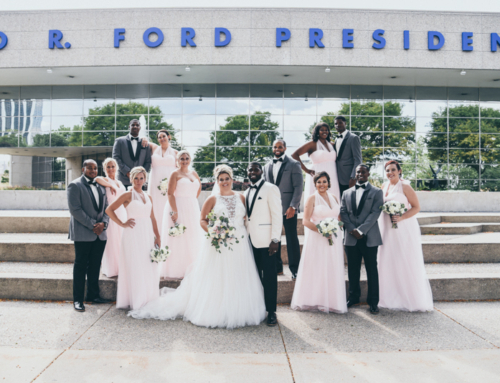 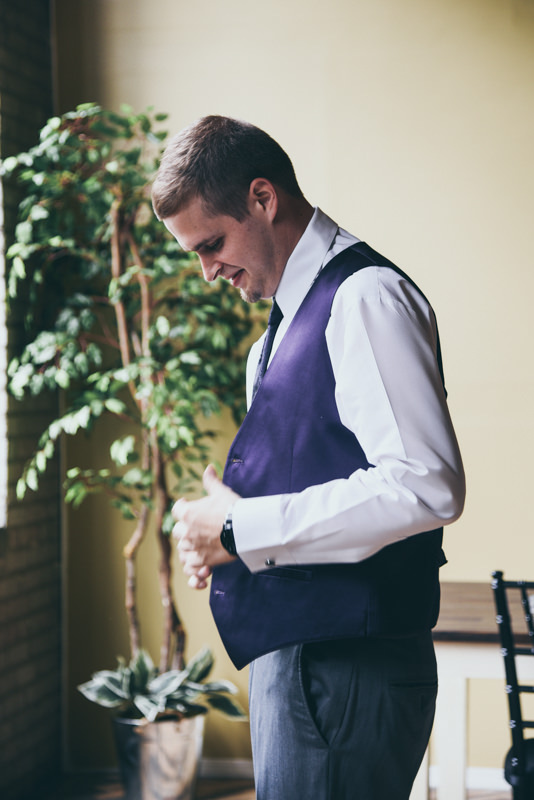 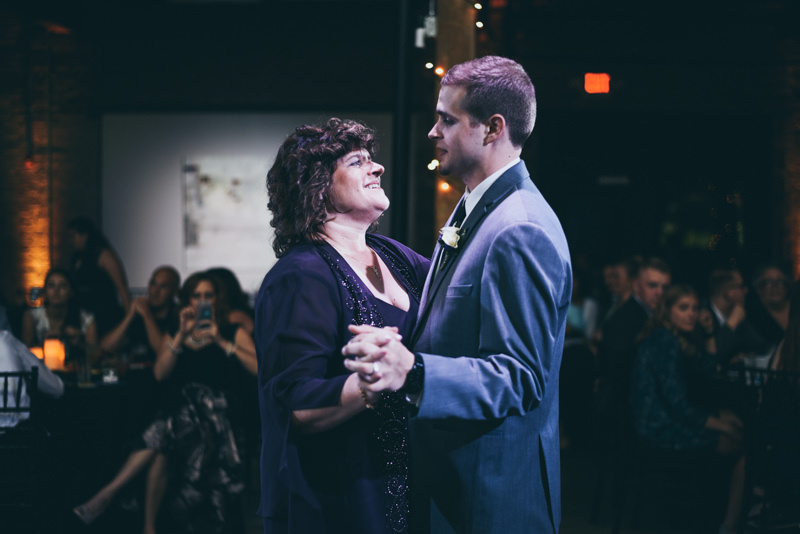 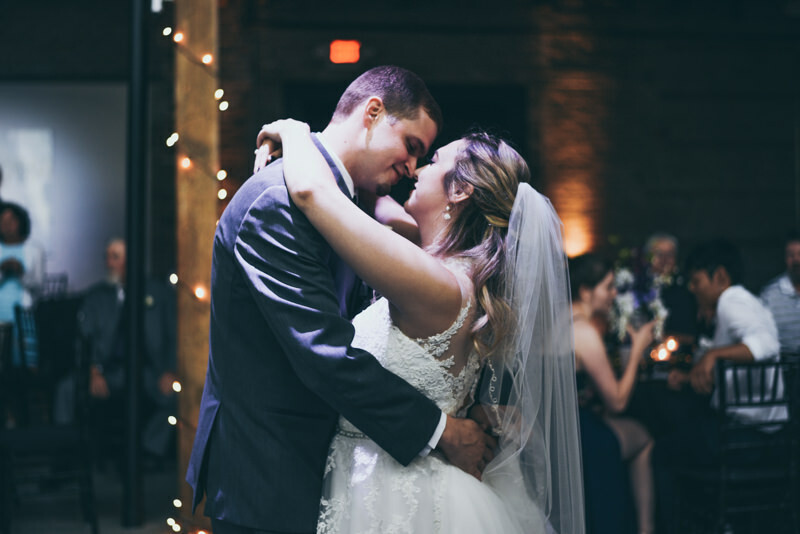 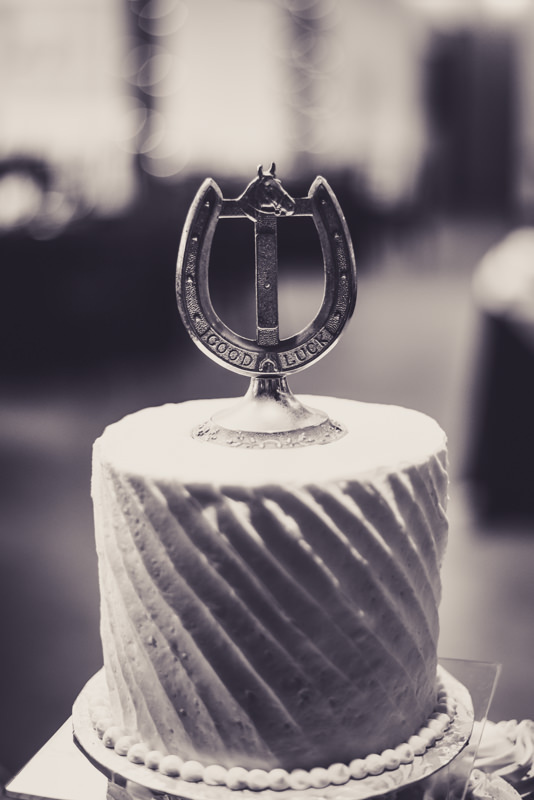 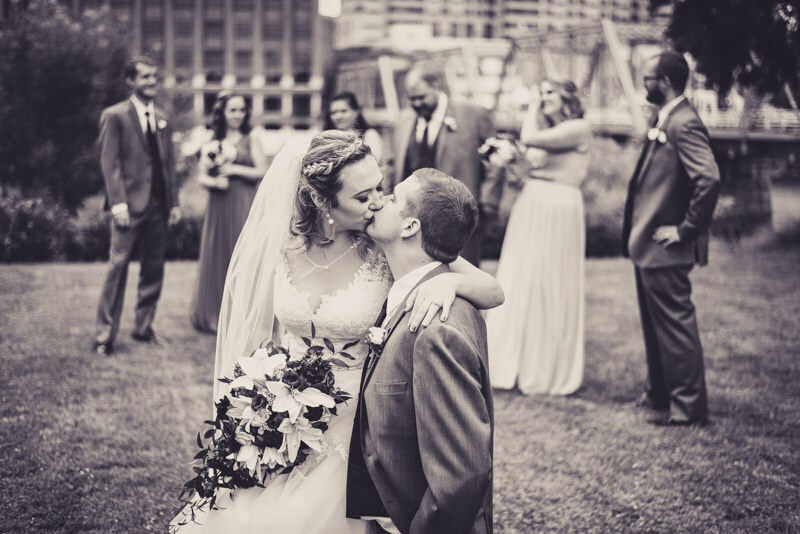 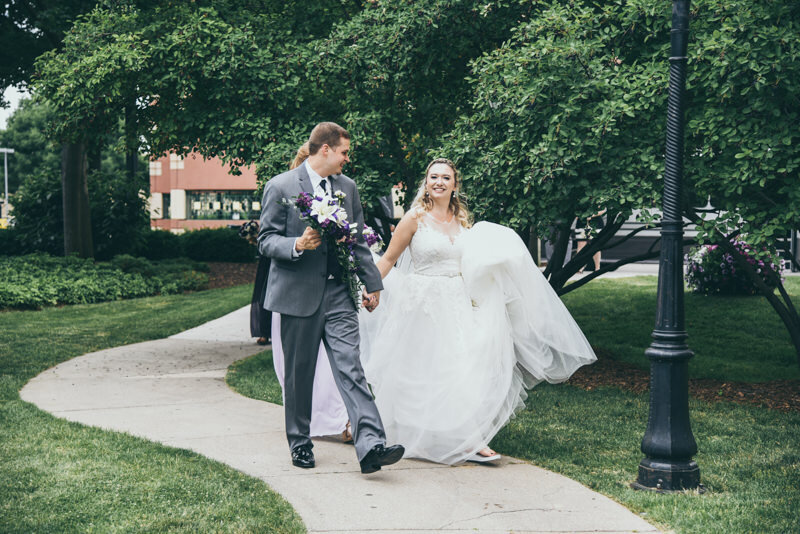 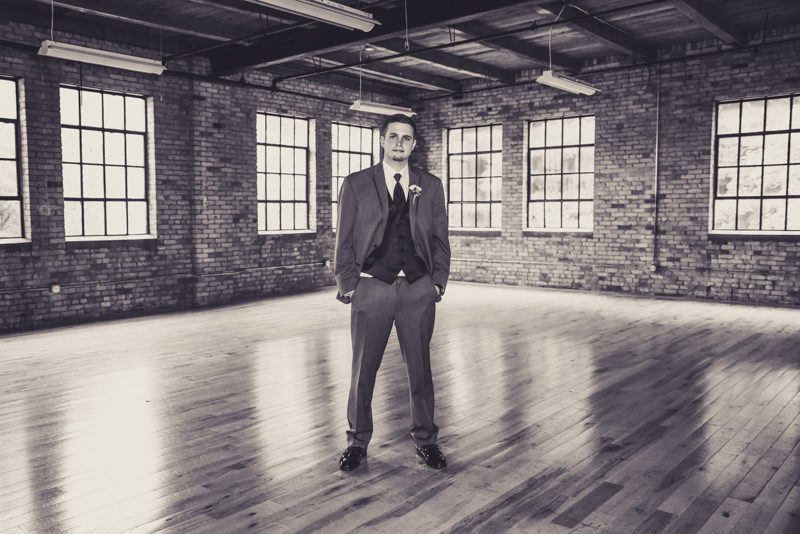 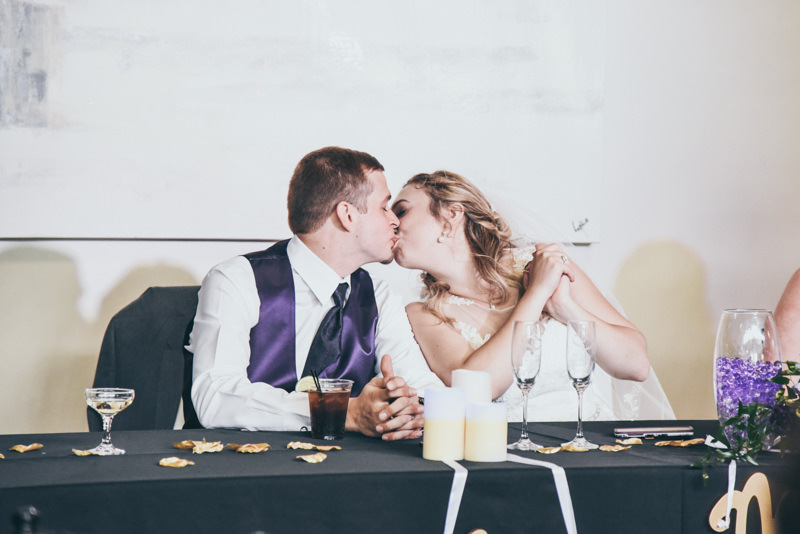 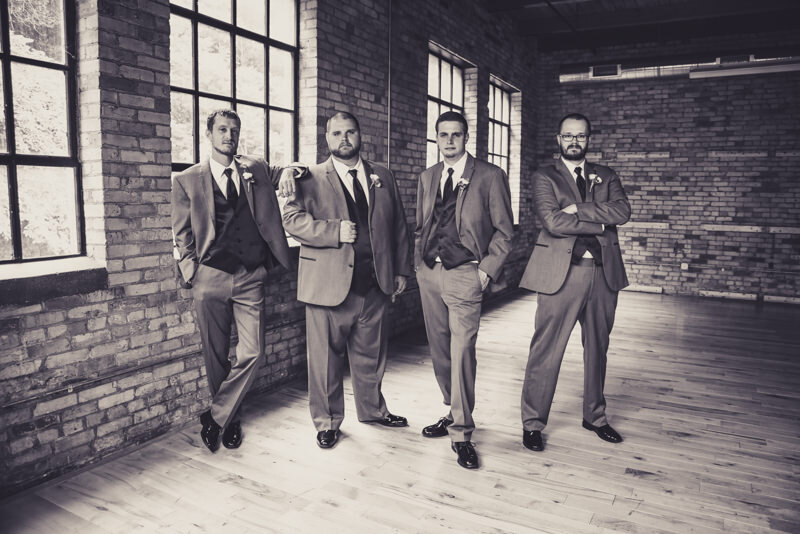 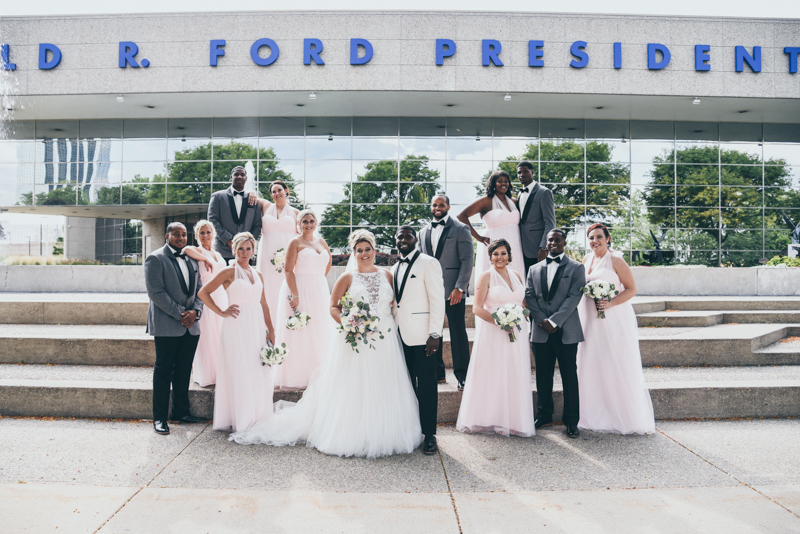 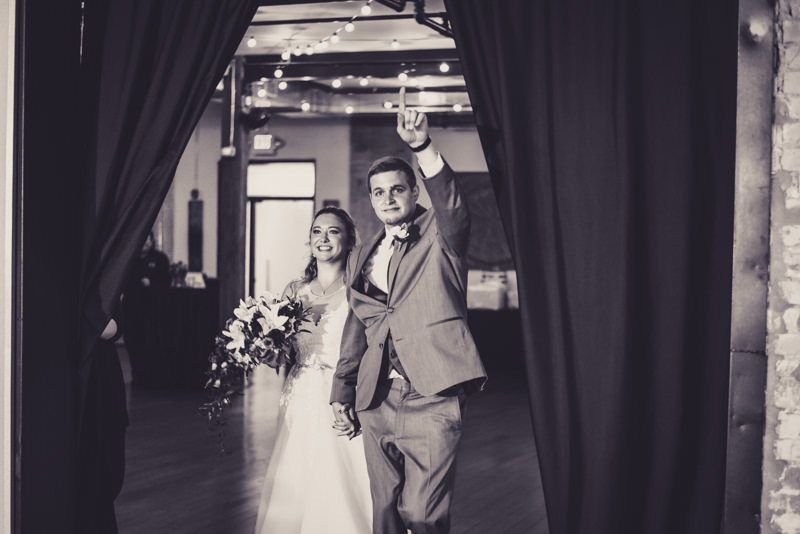 We were excited to work with them, providing the venue for both ceremony and reception, photography, tuxedos, floral design, and late night pizza! 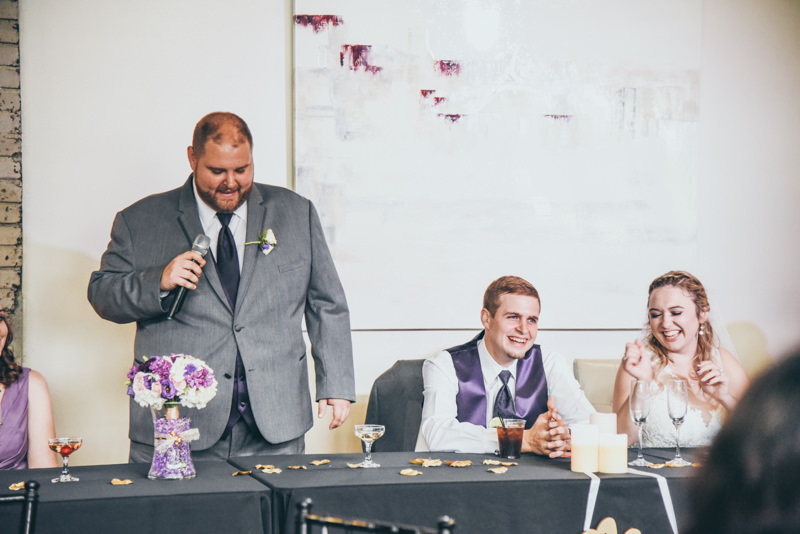 Our staff enjoyed every moment! 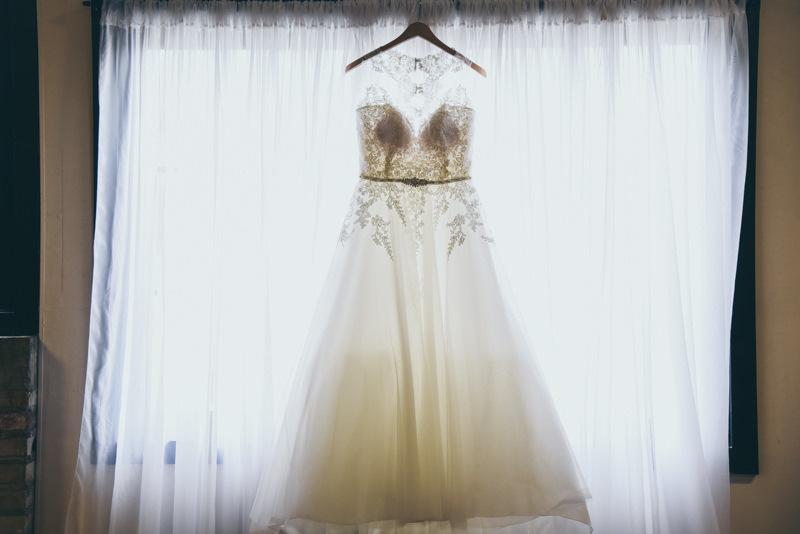 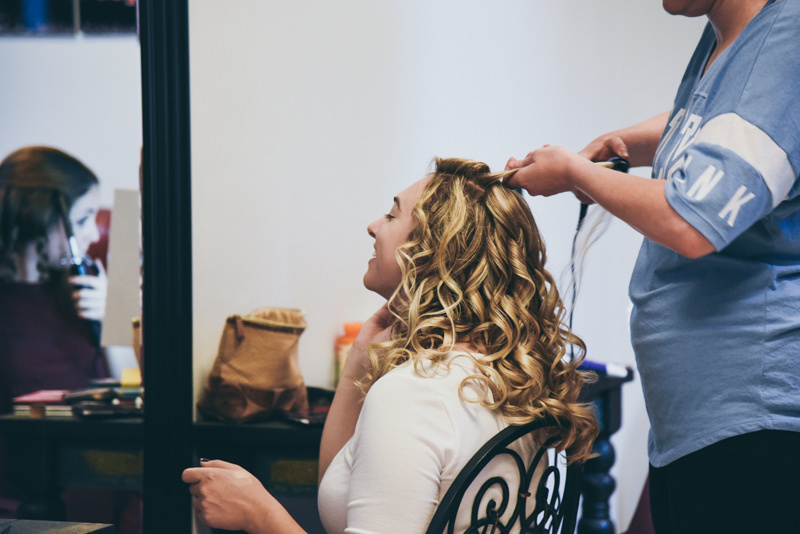 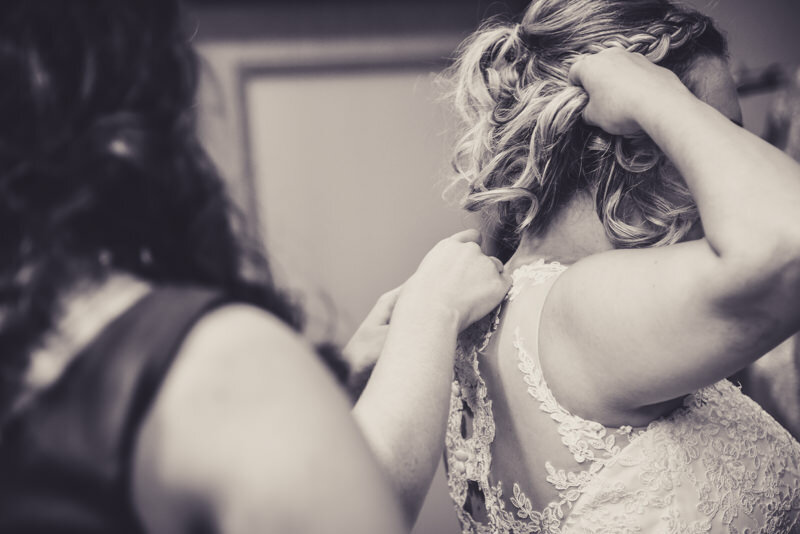 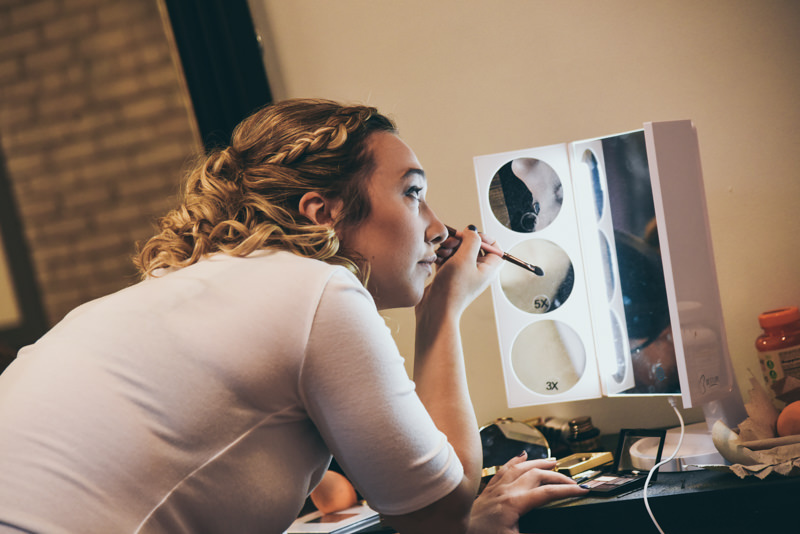 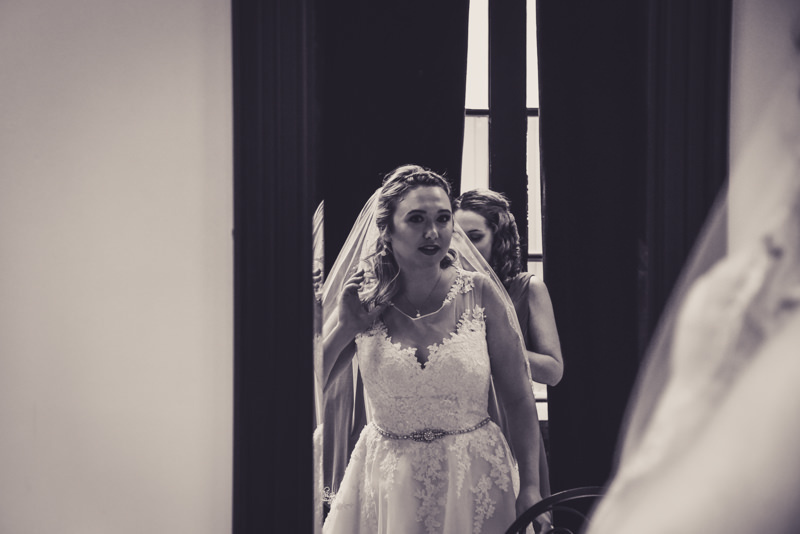 Claire was able to get ready in our original Bridal Suite, with vintage touches like an old red diner bench, and lots of natural light from the large windows. 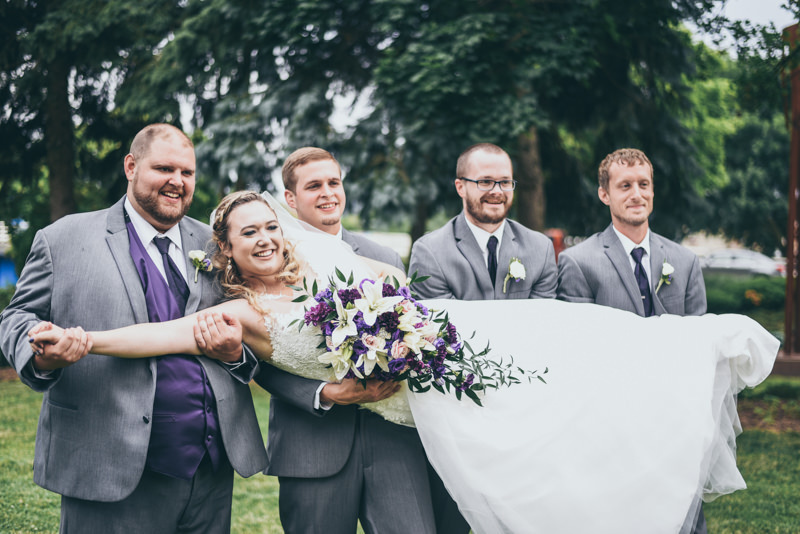 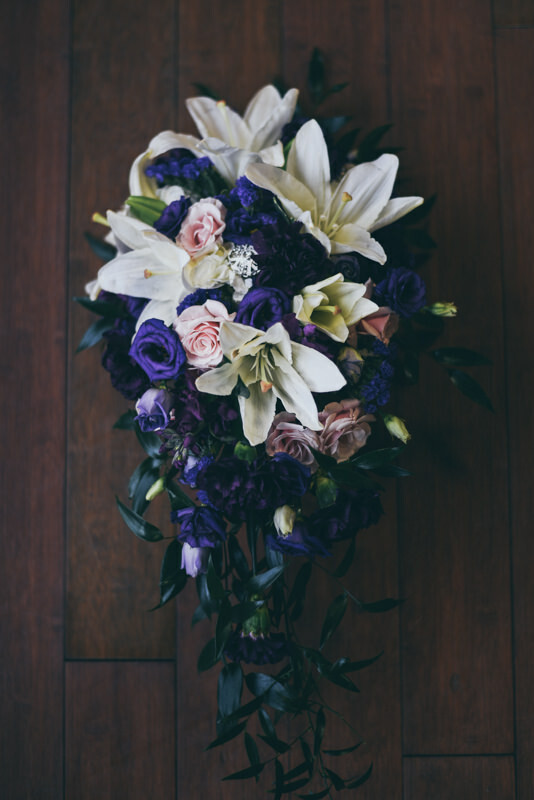 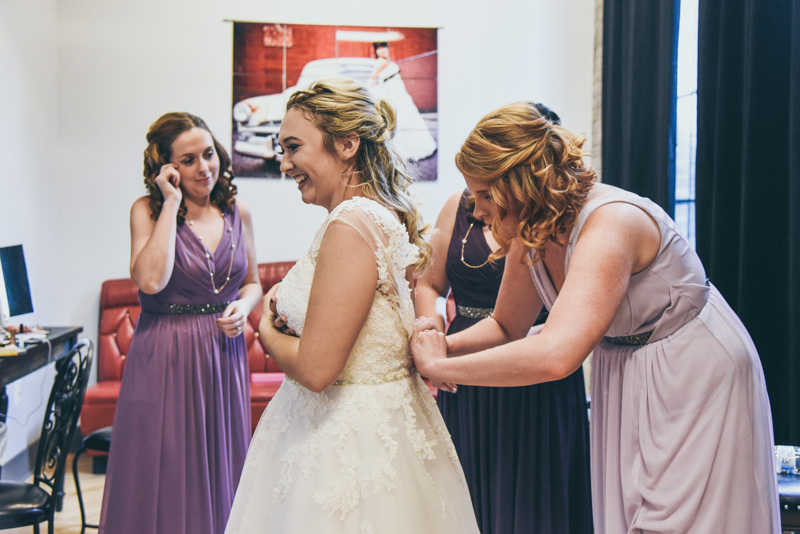 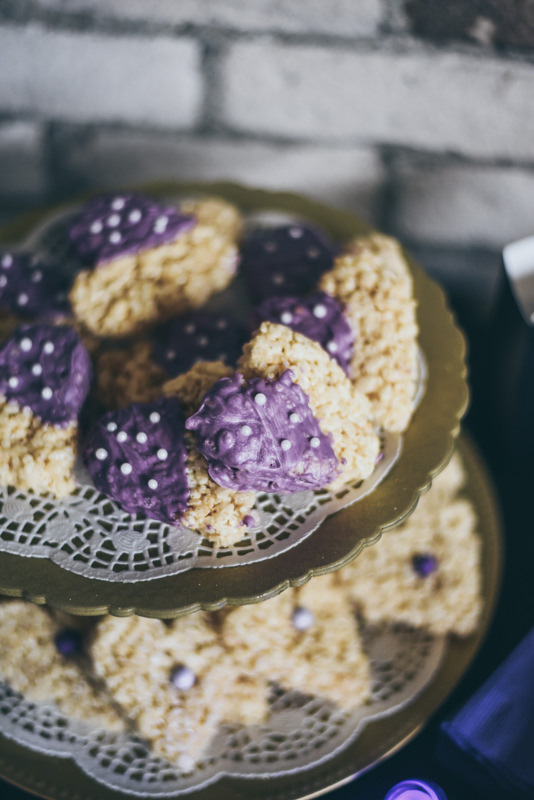 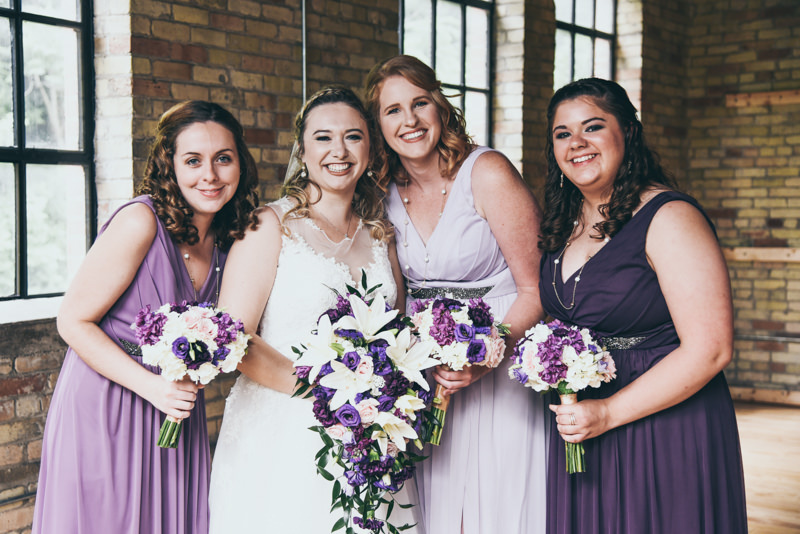 Her bridesmaids dressed in flowy dresses in varying shades of purple, coordinating with Claire’s bridal bouquet full of purple, lavender, and rich plum colored flowers. 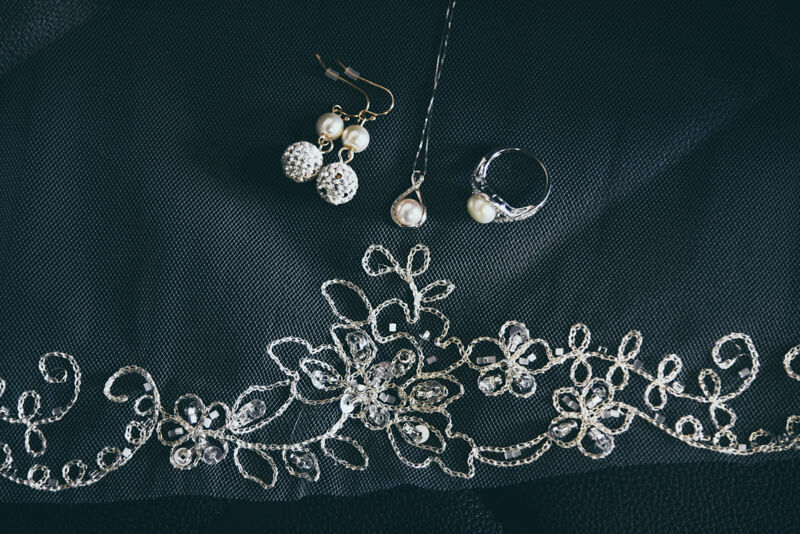 Our floral design team also added pearl and rhinestone accents to Claire’s bouquet to match the glittering details of her wedding gown. 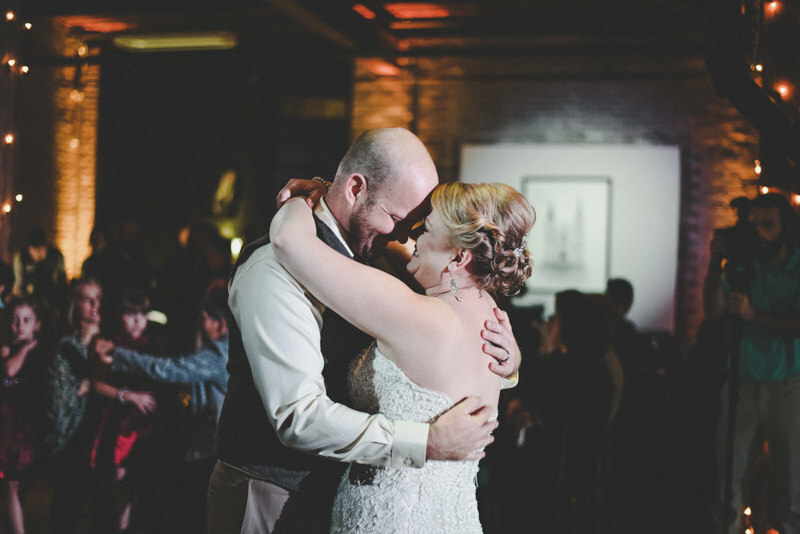 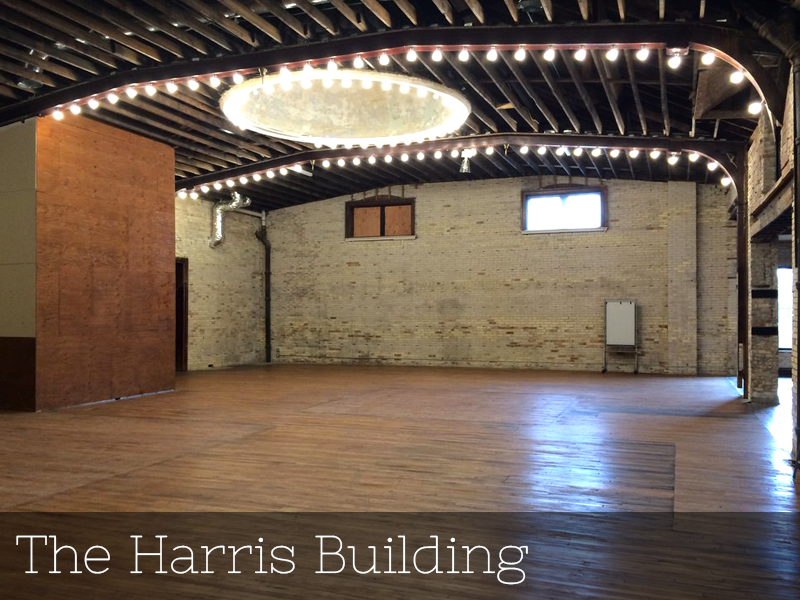 Further down the hall, Geoff was in our newer Groom’s Room, a large room with exposed brick walls, original hardwood floors, and large windows. 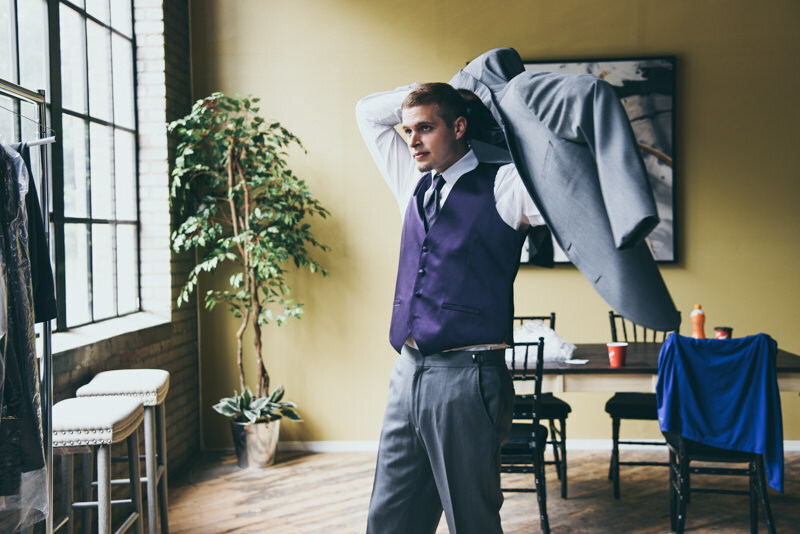 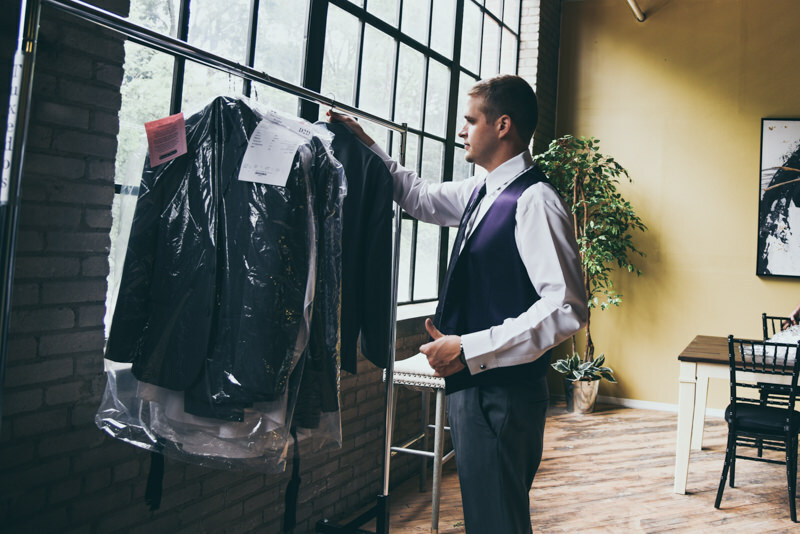 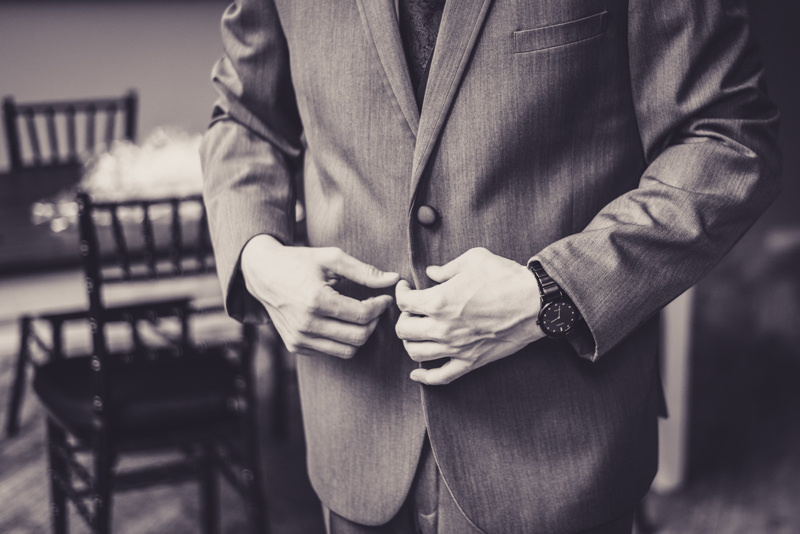 The guys chose our Michael Kors medium wash gray tuxedo coat and pants. 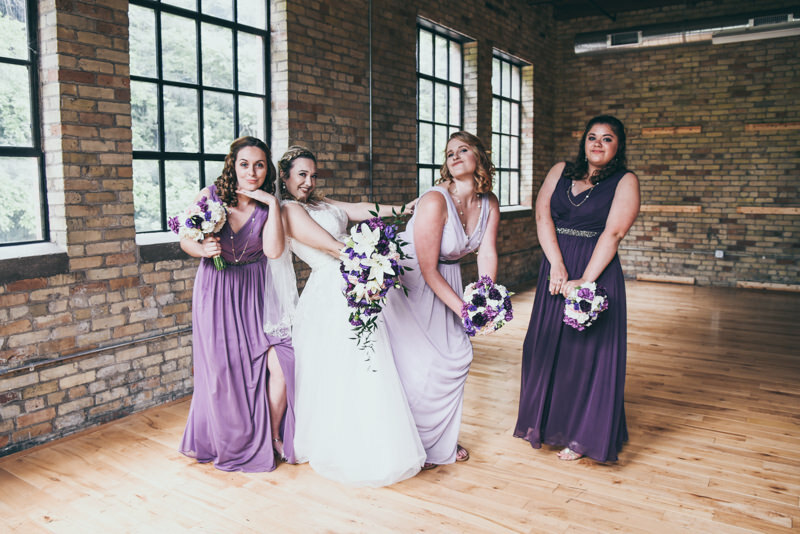 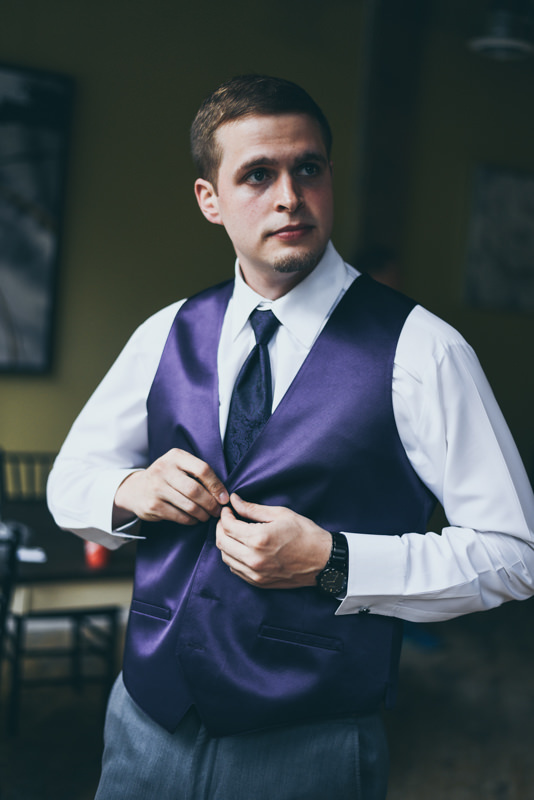 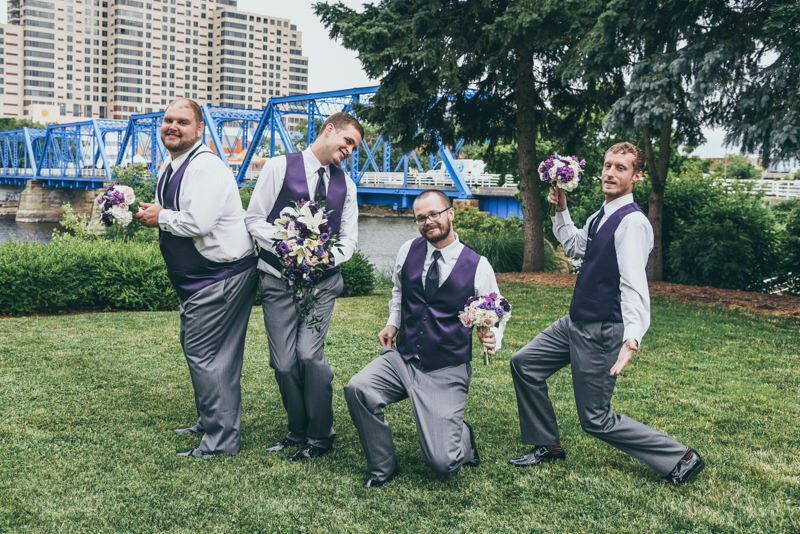 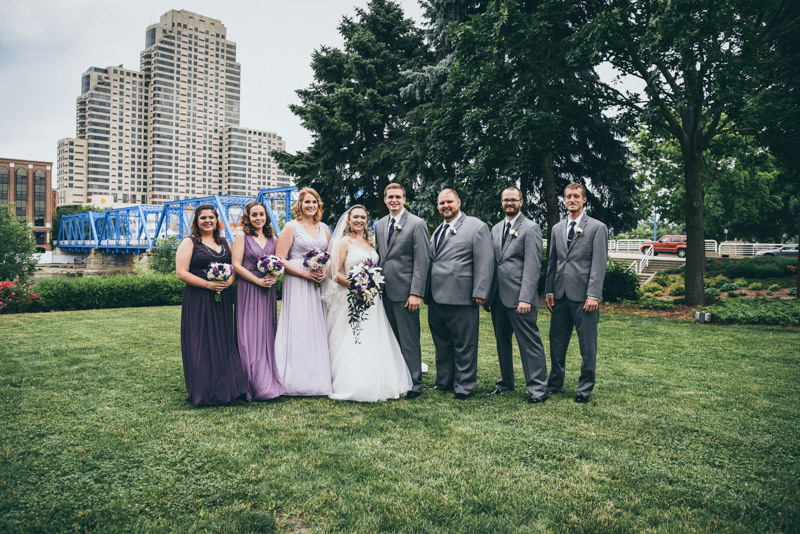 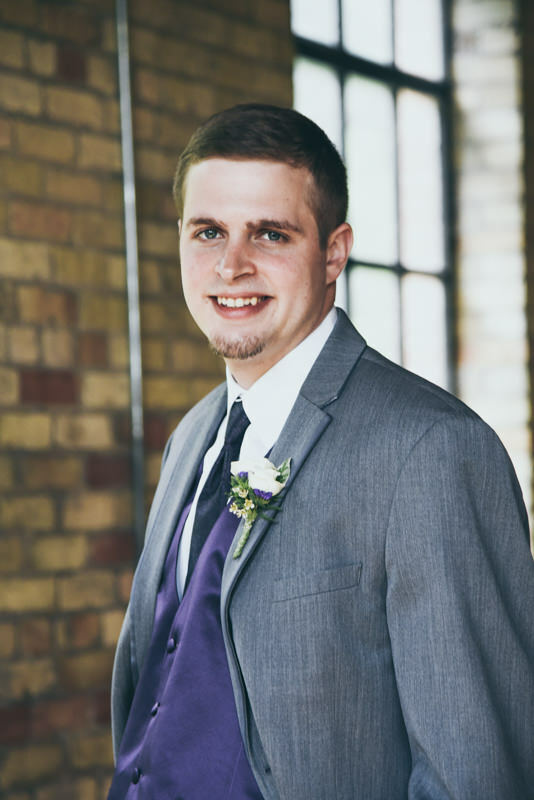 They paired this with a purple vest, purple paisley printed tie, and black square toe shoes, for a really great look that matched so well with the floral decor and the bridesmaid’s dresses! 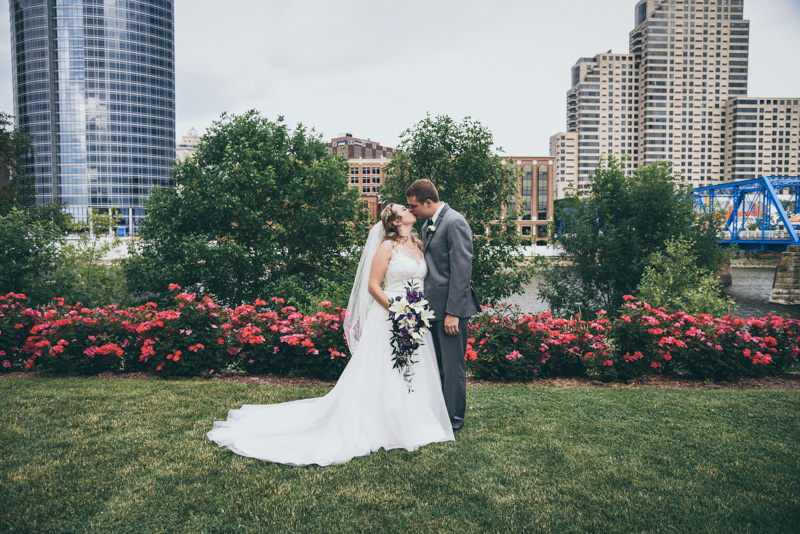 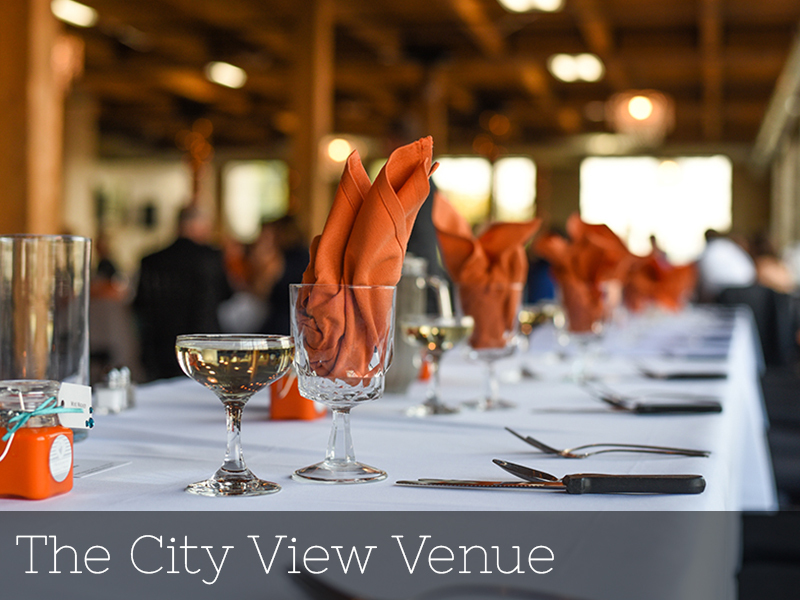 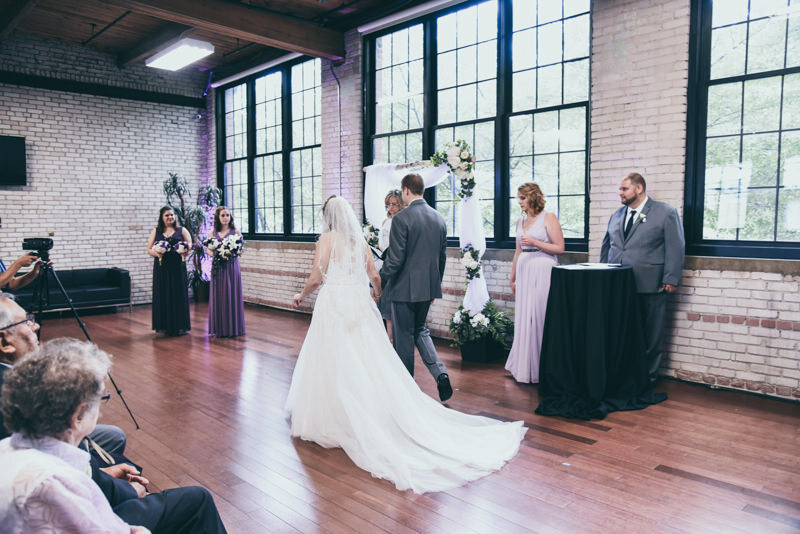 Geoff and Claire were not going to see each other before the ceremony, and we were able to sneak them up separately to our City View Venue on the third floor to take some photos. 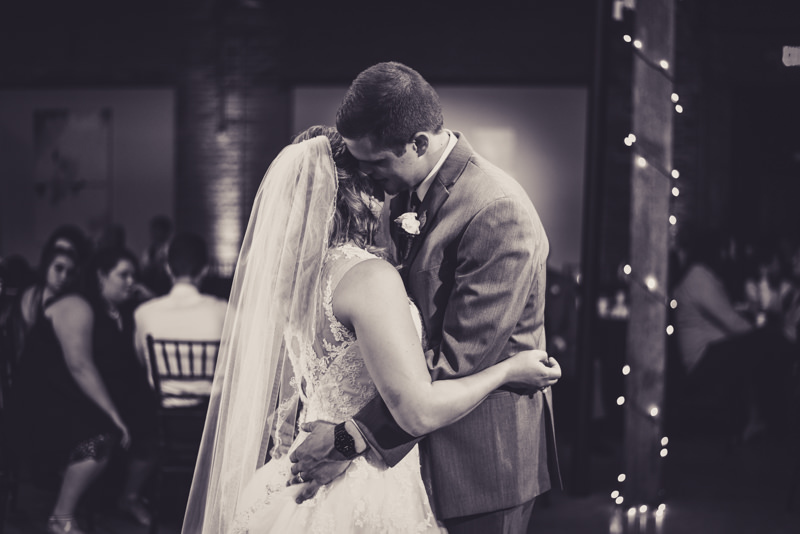 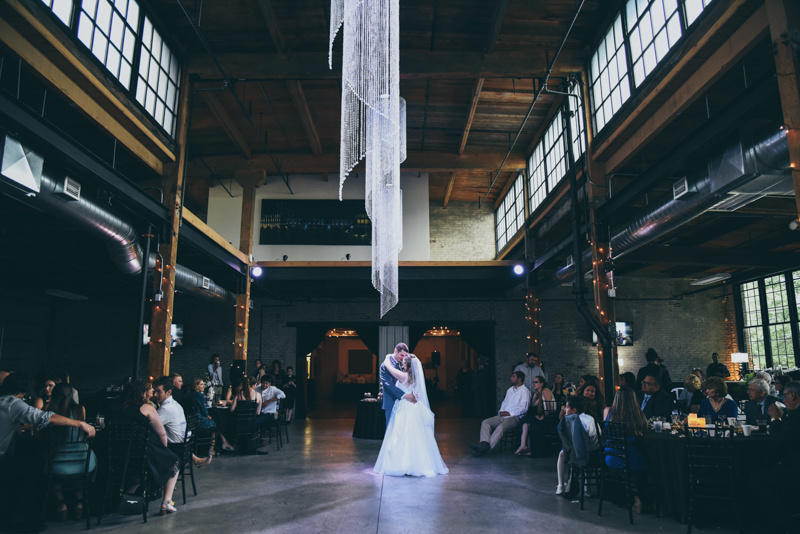 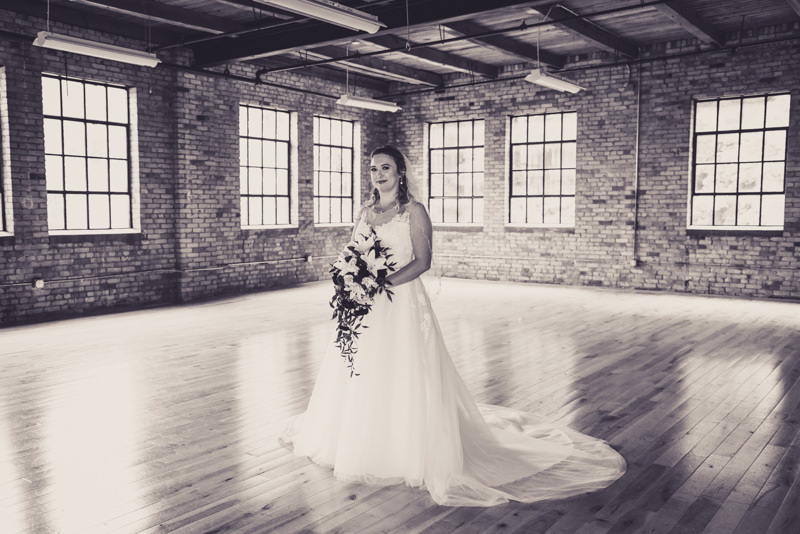 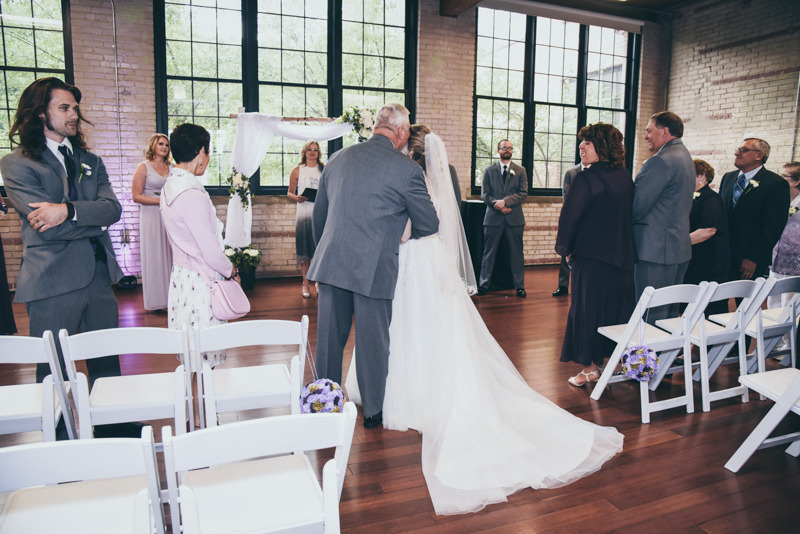 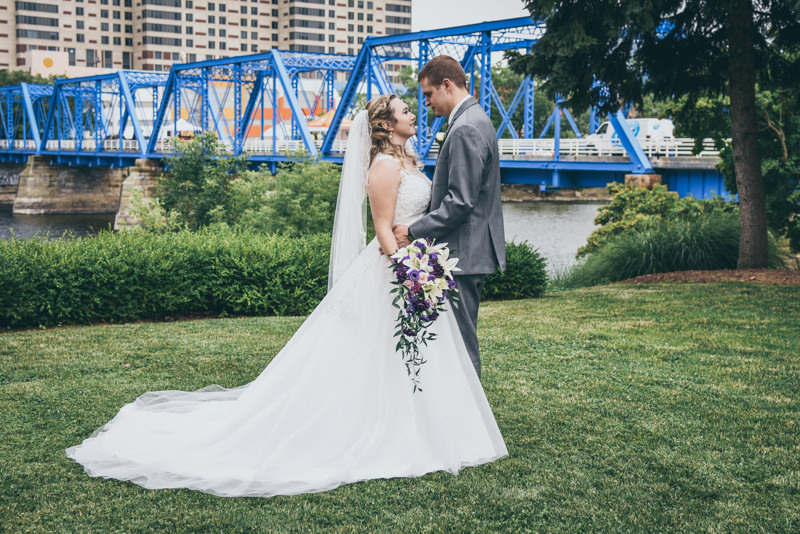 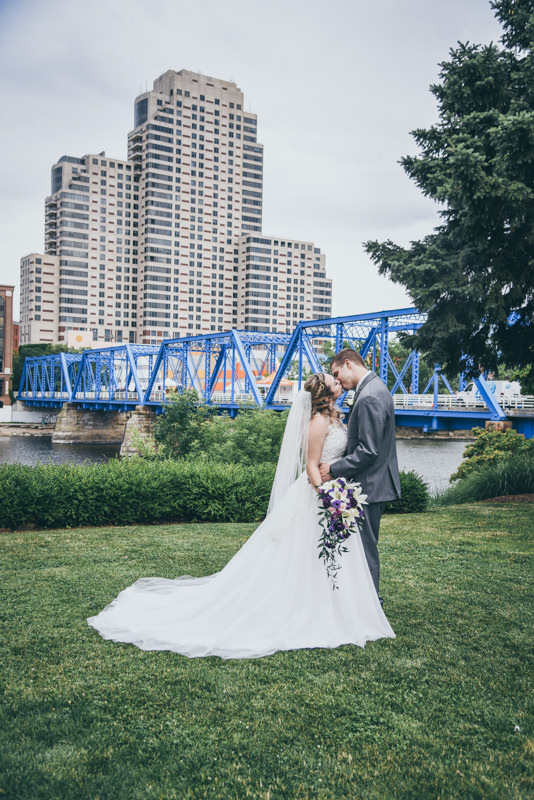 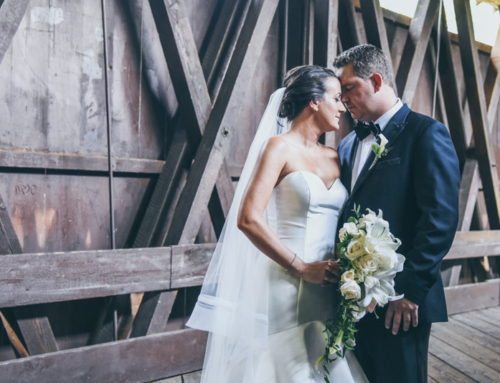 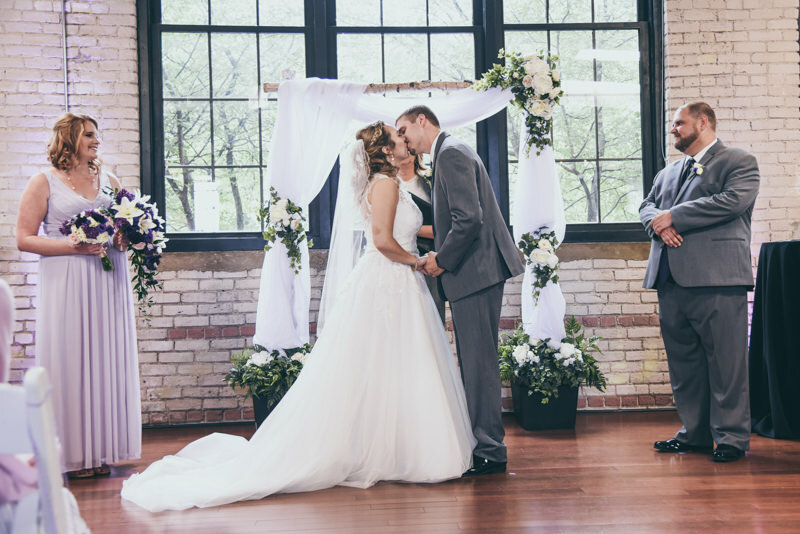 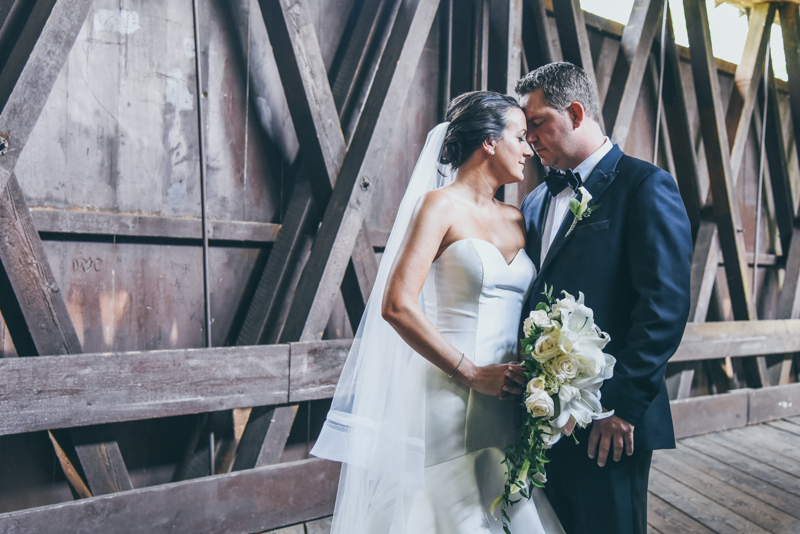 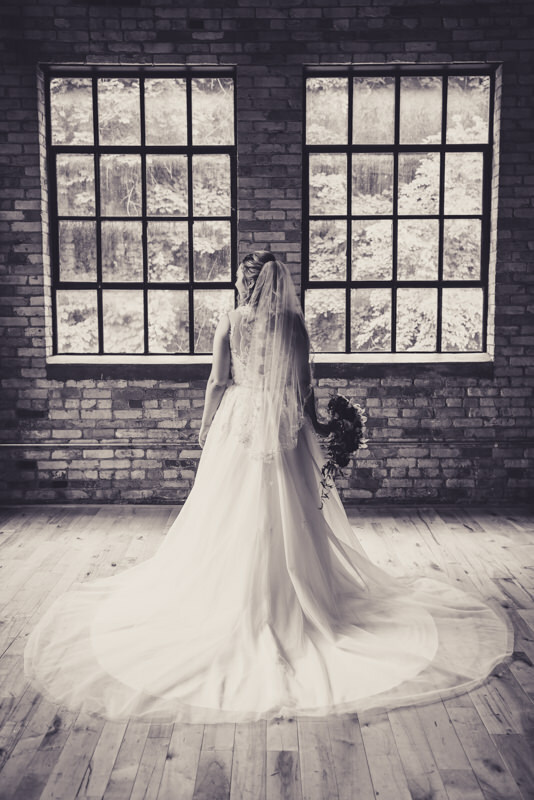 The gorgeous setting of exposed beams, crystal chandeliers, and the Grand Rapids skyline behind them, made for some pretty great photos! 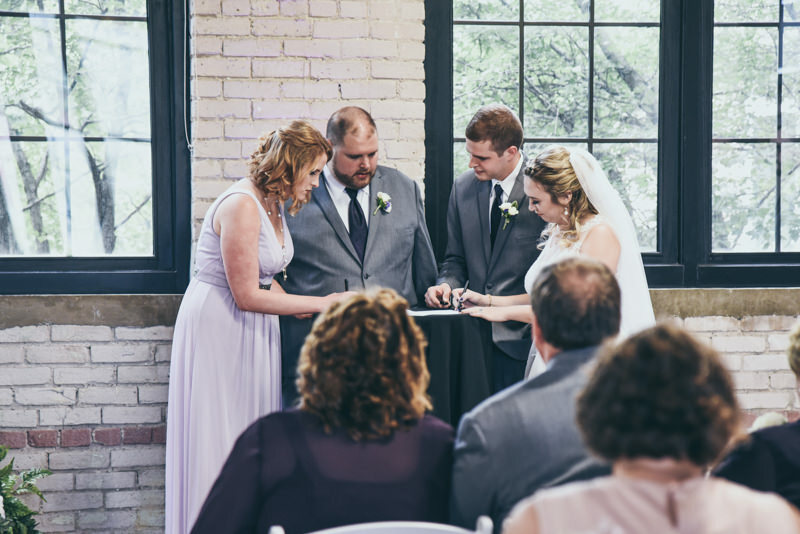 A Loft Ceremony with Pearl Rings and Handcuffs! 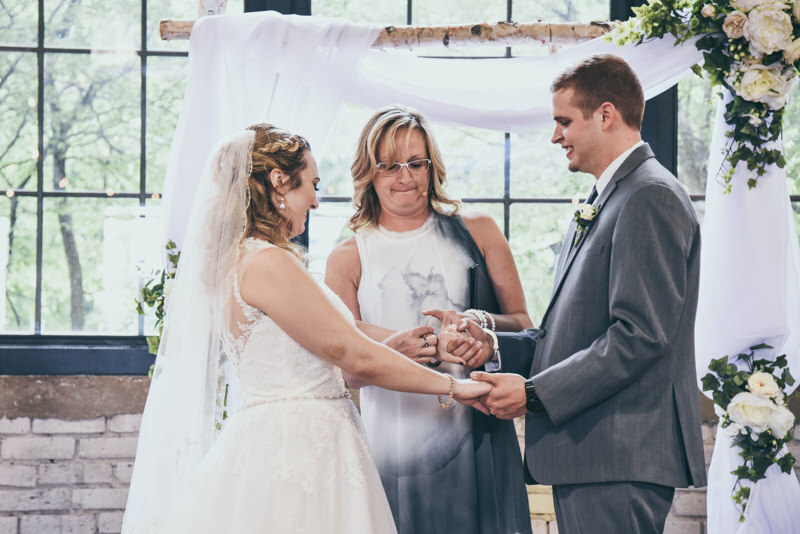 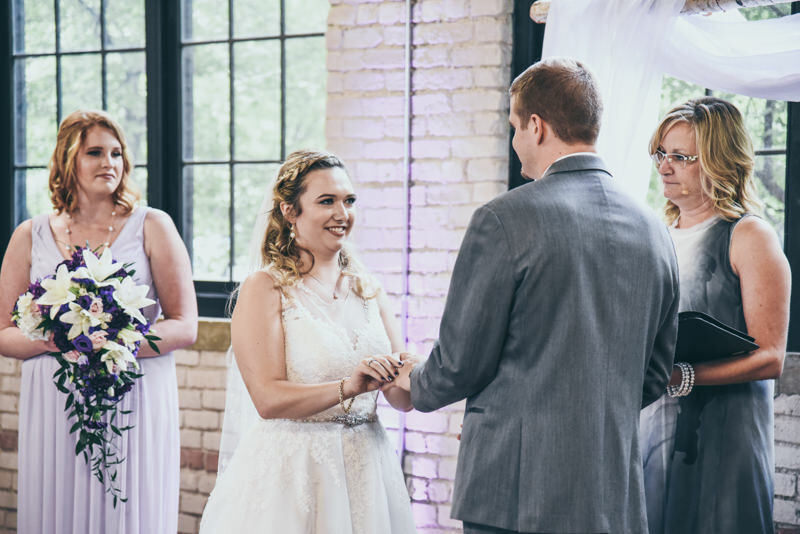 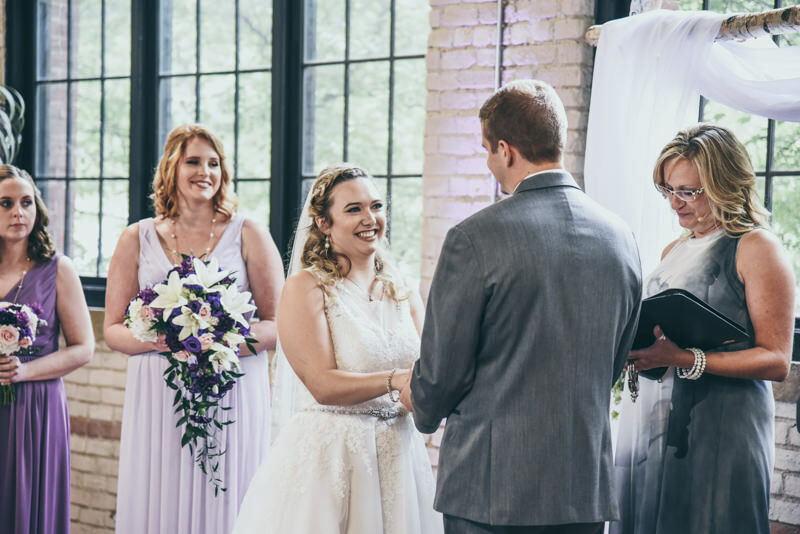 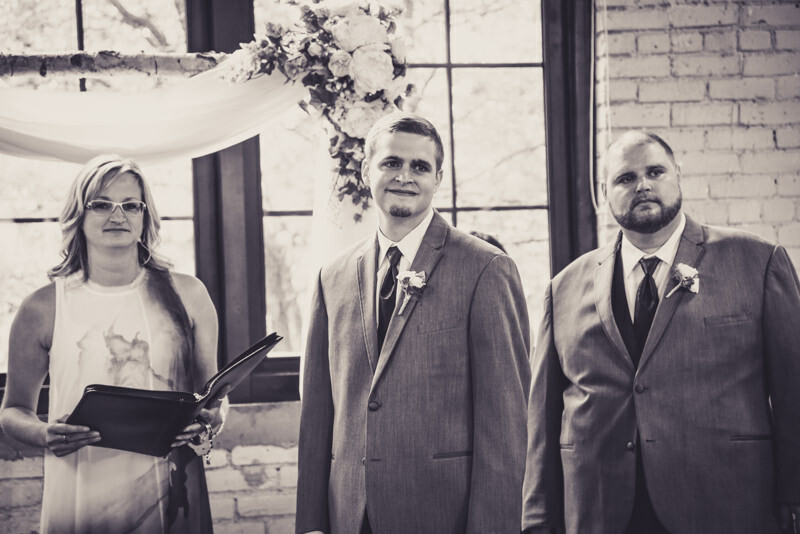 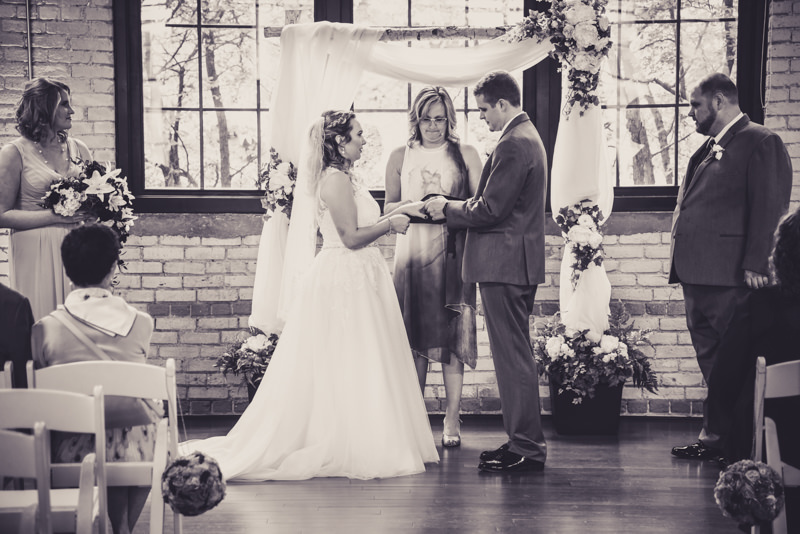 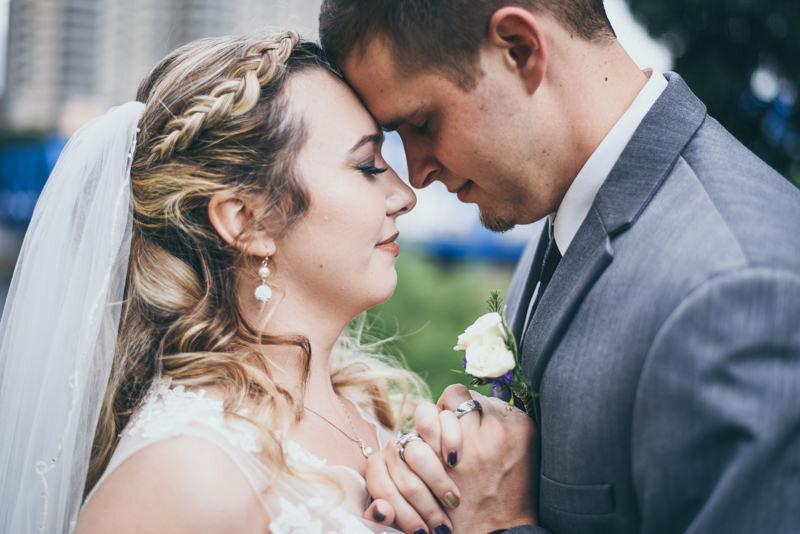 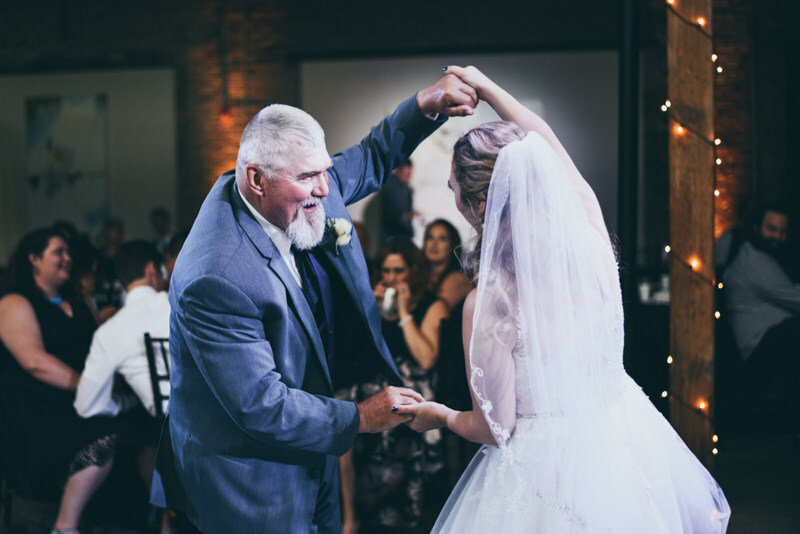 This ceremony was wonderful, emotional, and followed standard protocol for a wedding ceremony…until the bride and groom handcuffed themselves together in a special unity type ceremony! 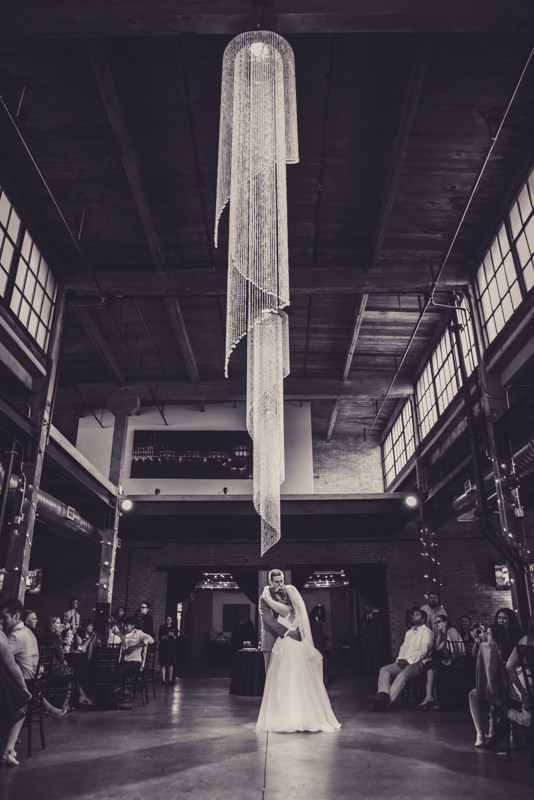 It’s not often we see something new, but this fit the bill! 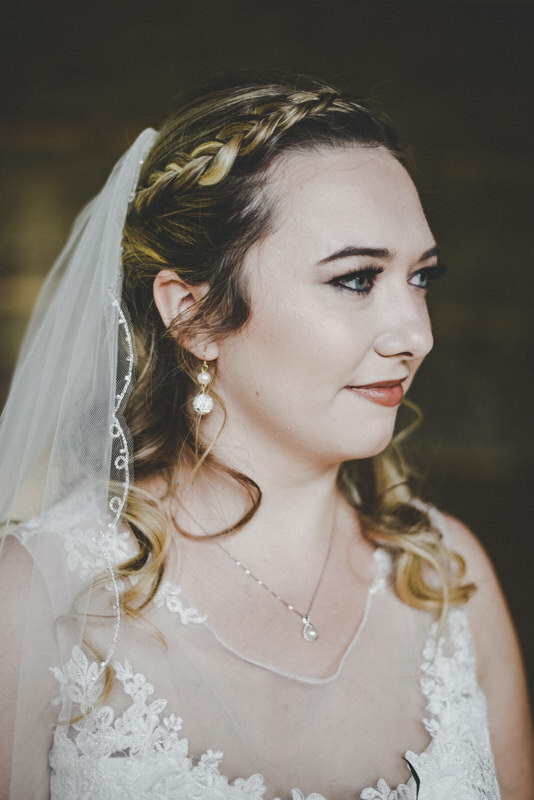 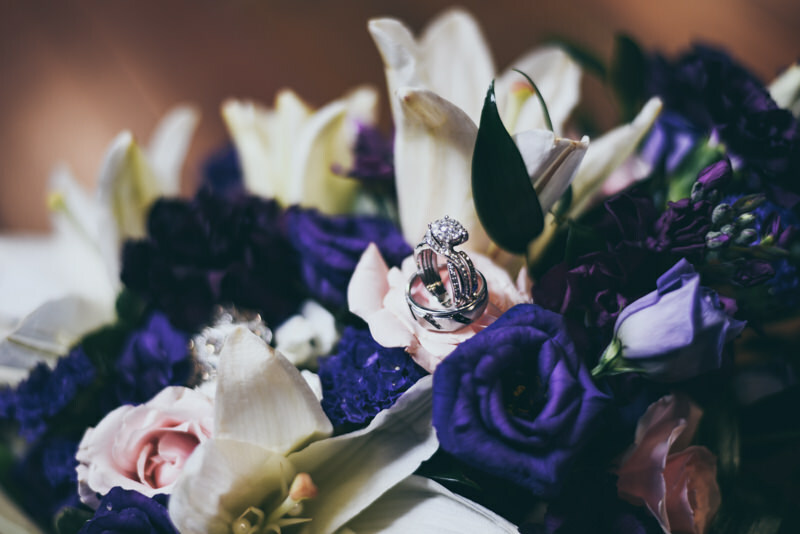 On a softer note, Claire wore a beautiful pearl ring down the aisle to meet Geoff, since her wedding and engagement rings were pre-soldered and waiting for her at the end of the aisle. 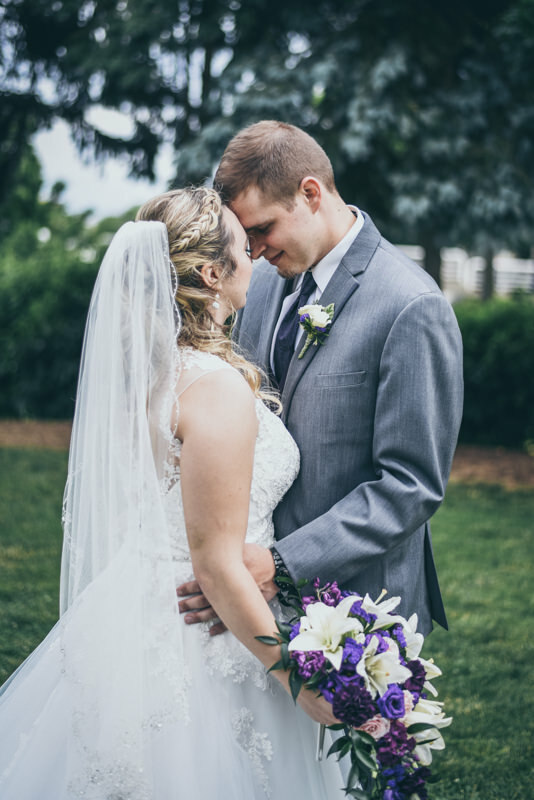 Since they hadn’t seen each other ahead of time, it was amazing for us to be witness to the love and emotion that was so obvious on Geoff’s face with his first view of Claire! 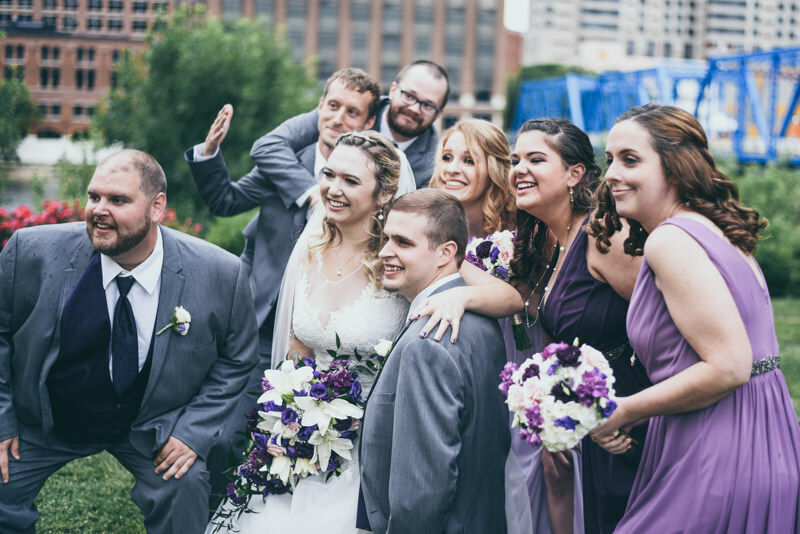 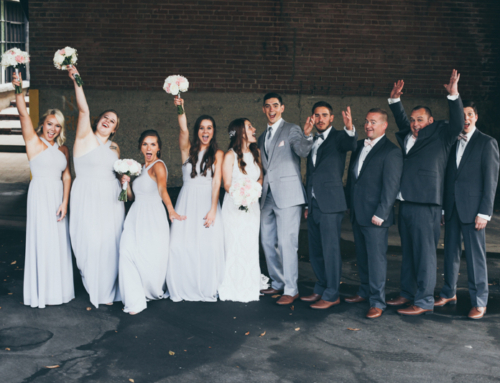 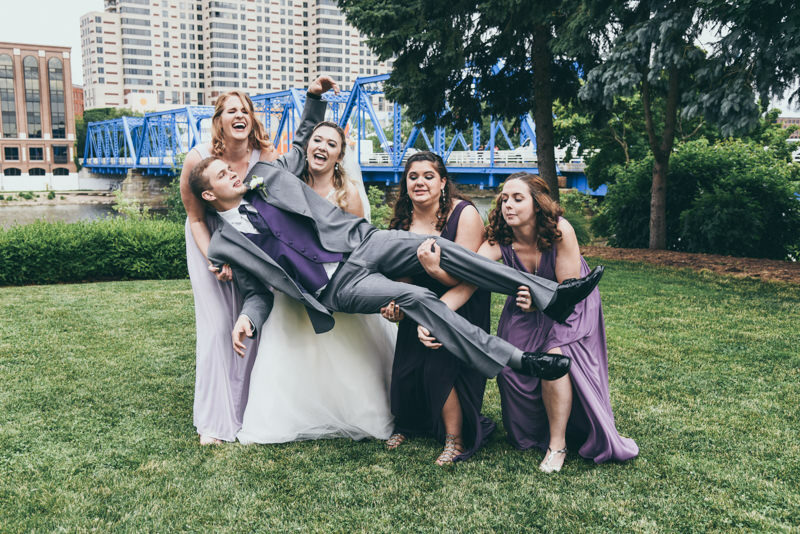 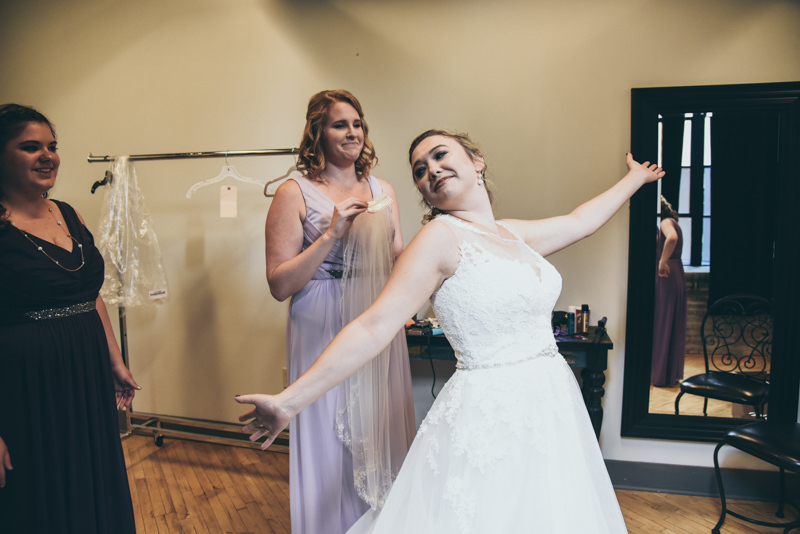 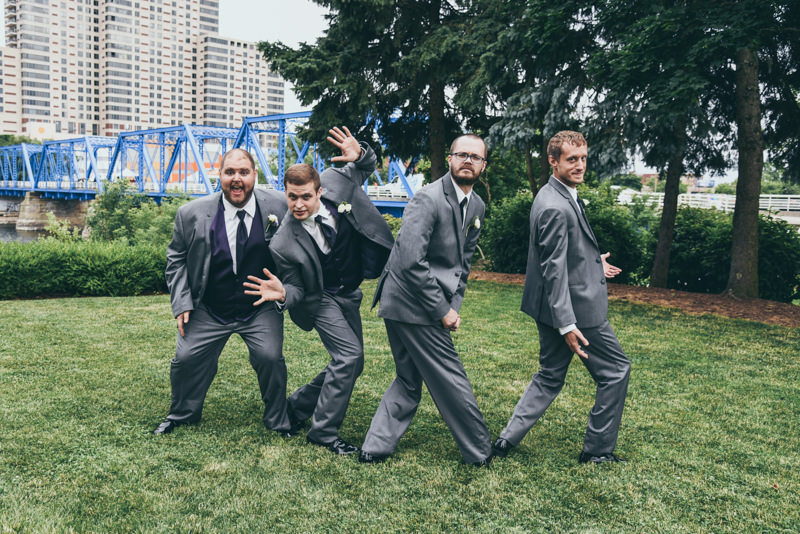 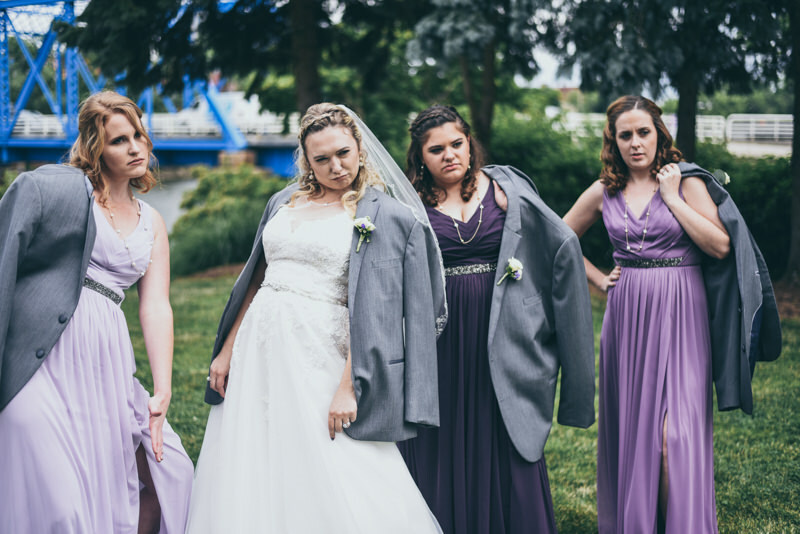 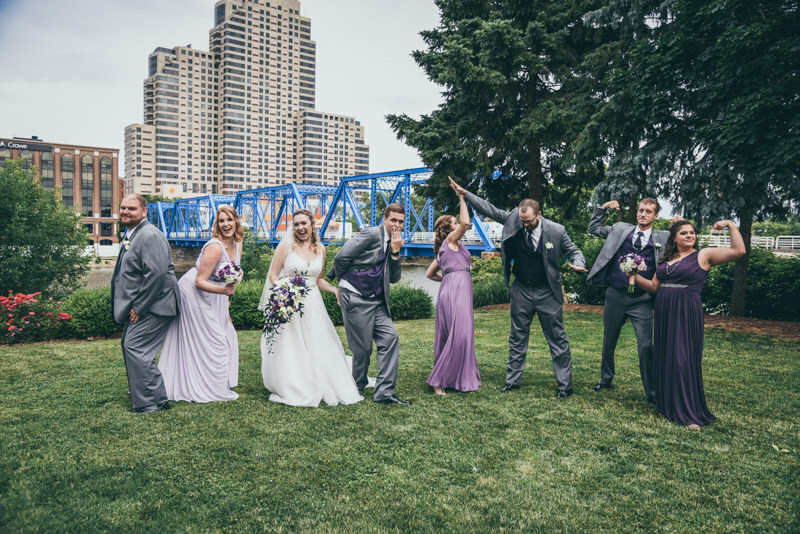 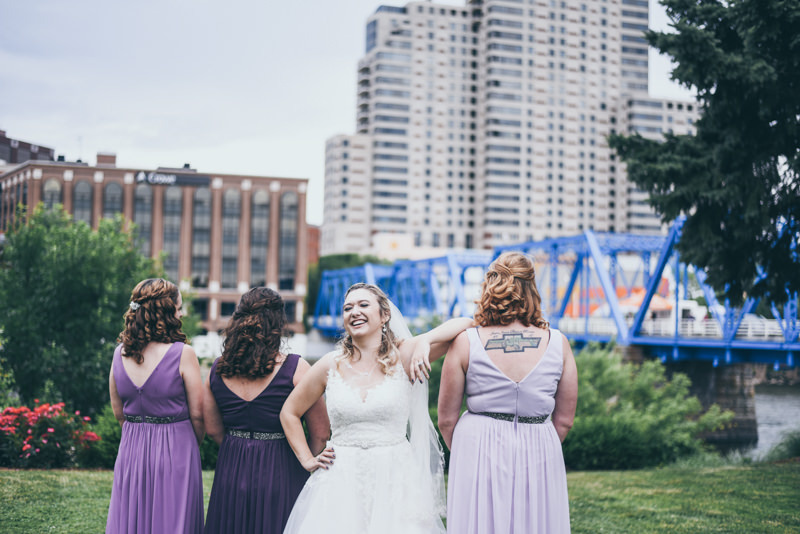 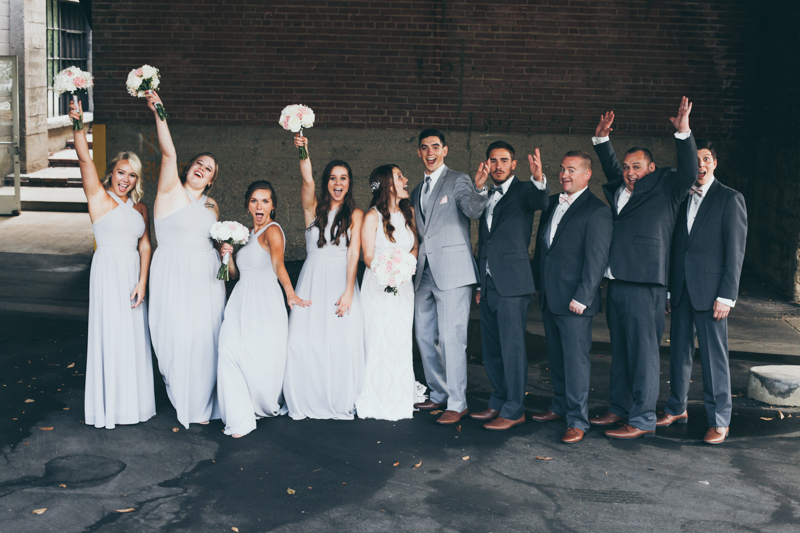 There wasn’t much time for fun photos, but our photo team of Nat and Emily rocked it out at the Blue Bridge and around the Public Museum, keeping everything on time, and even getting the bridal party back to the venue with time to spare! 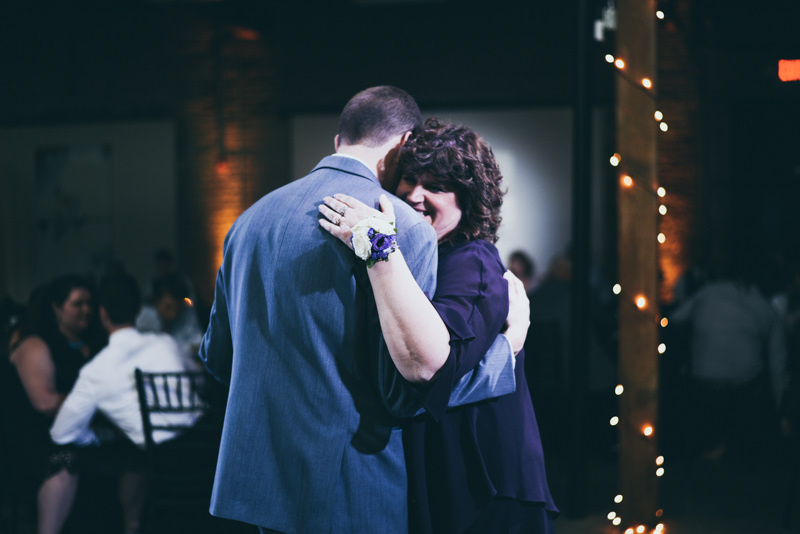 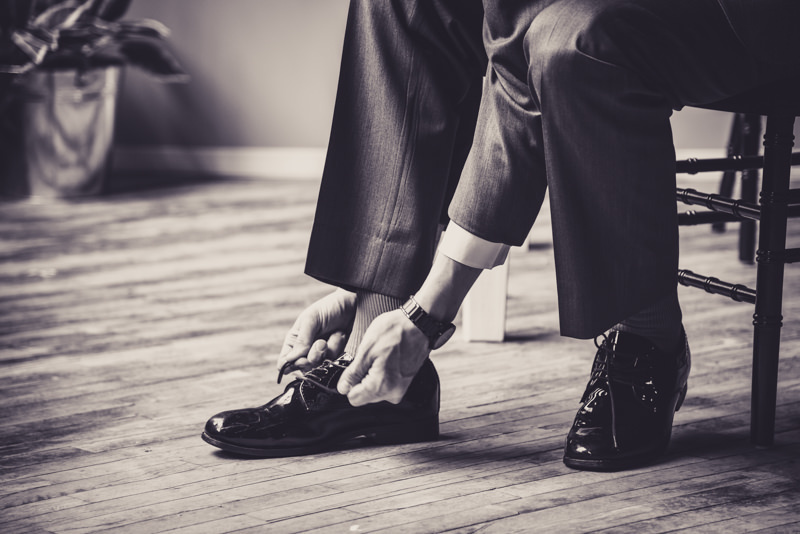 It’s awesome that our team has worked so closely together for so many years, when needed, they know just what to do! 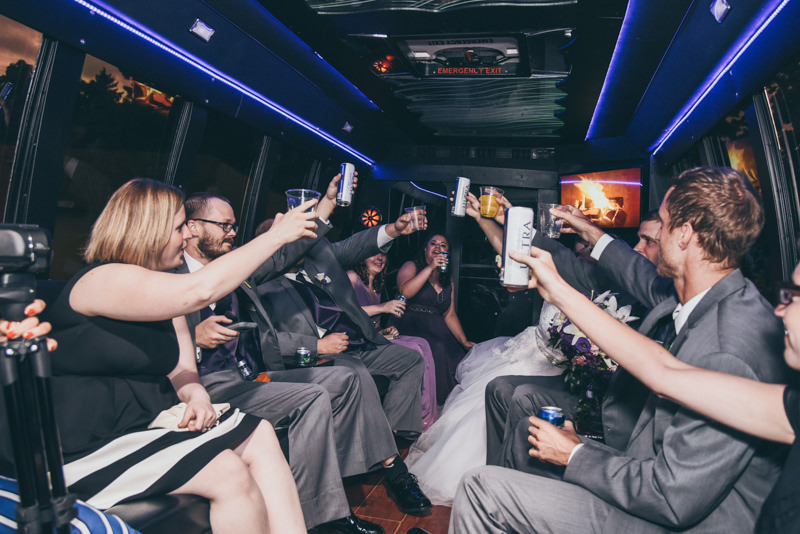 We were glad to have Affordable Limo’s Party Bus to get everyone back and forth! 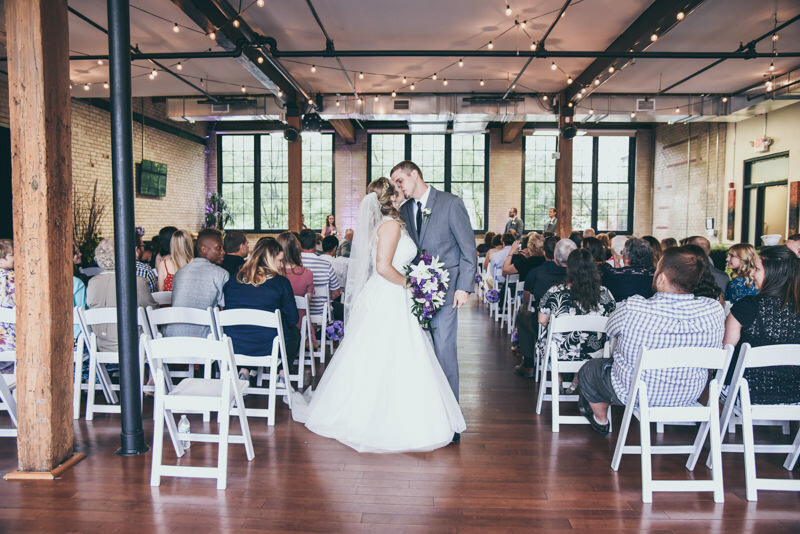 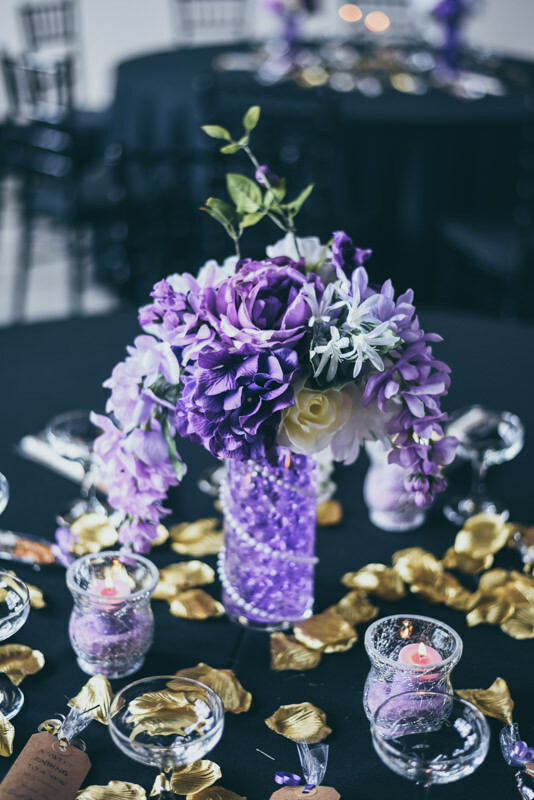 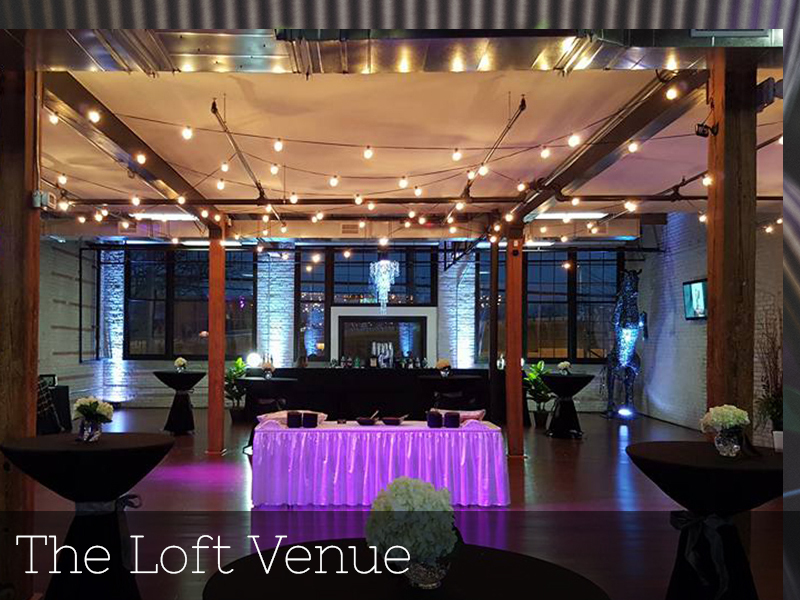 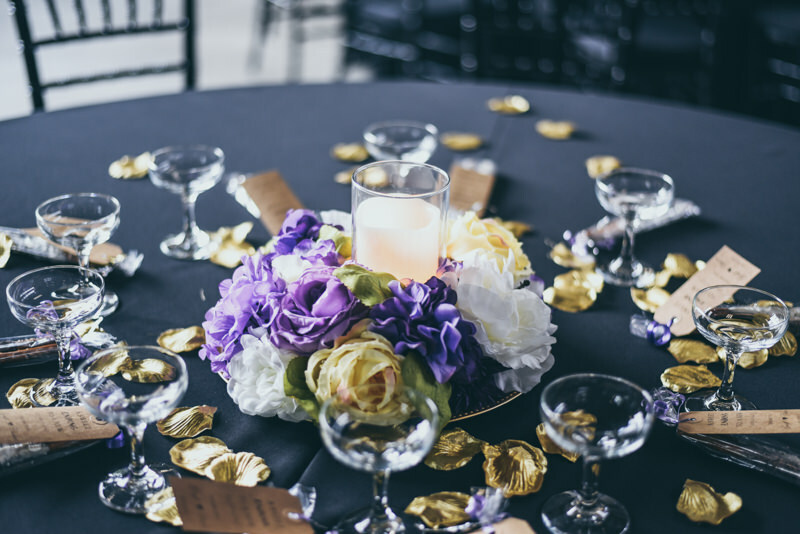 A Beautiful, Glittering, Purple Reception in the Loft Venue! 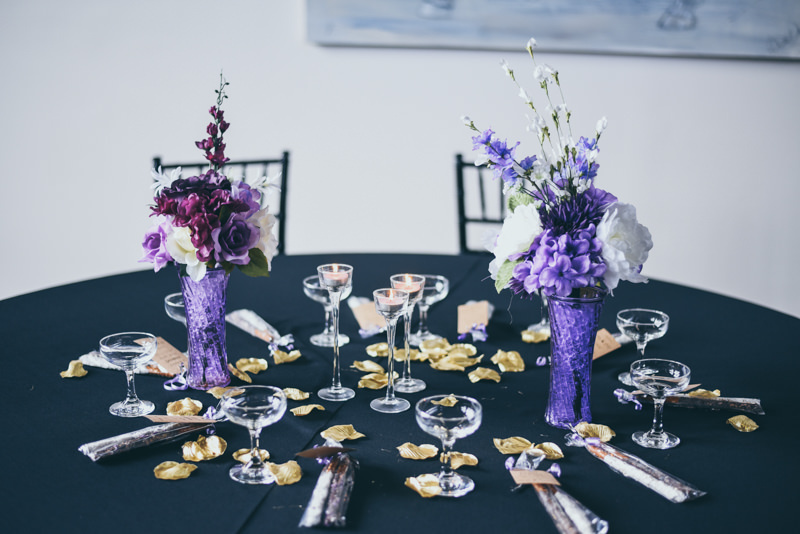 Claire and her Maid of Honor worked tirelessly to create beautiful silk floral displays for each table! 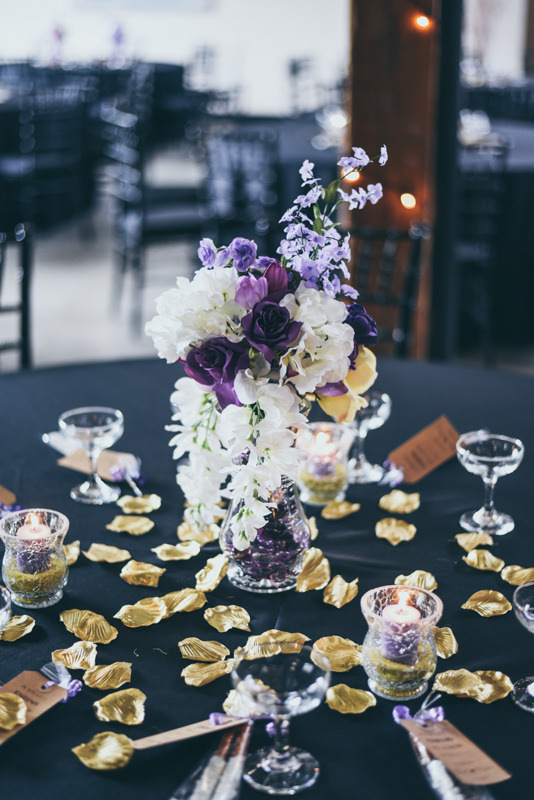 We love how the tablescapes pulled together and made everything feel so elegant! 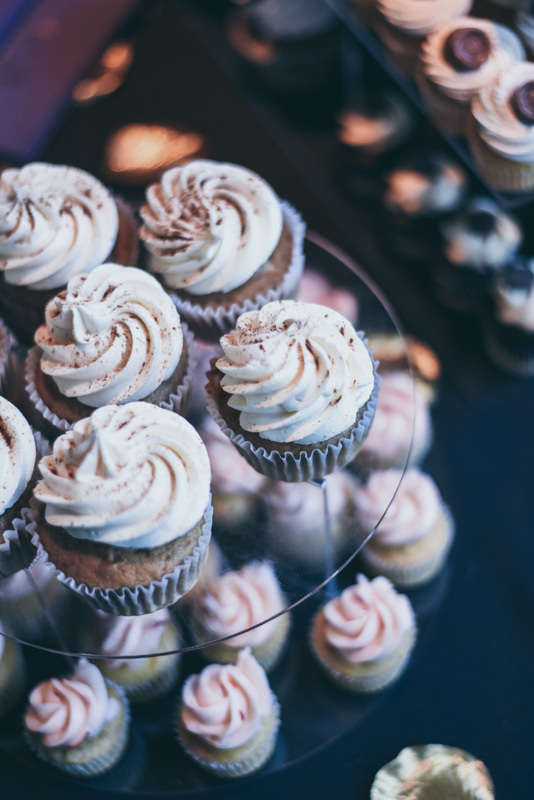 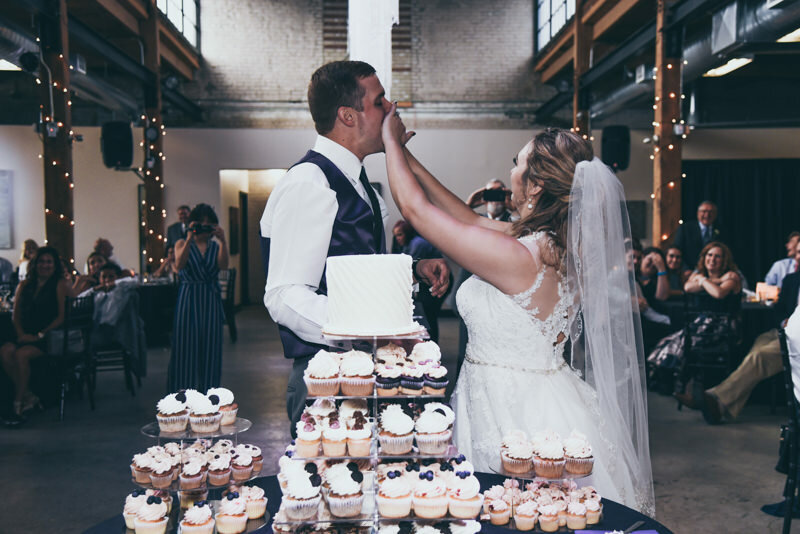 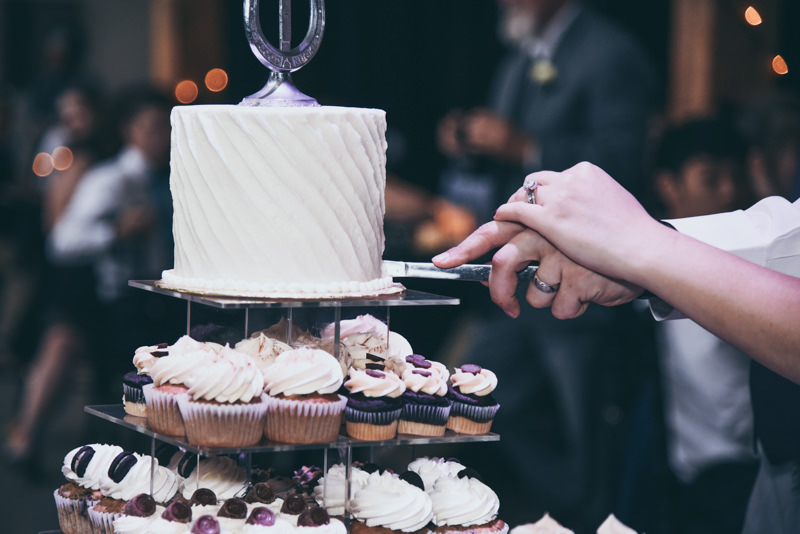 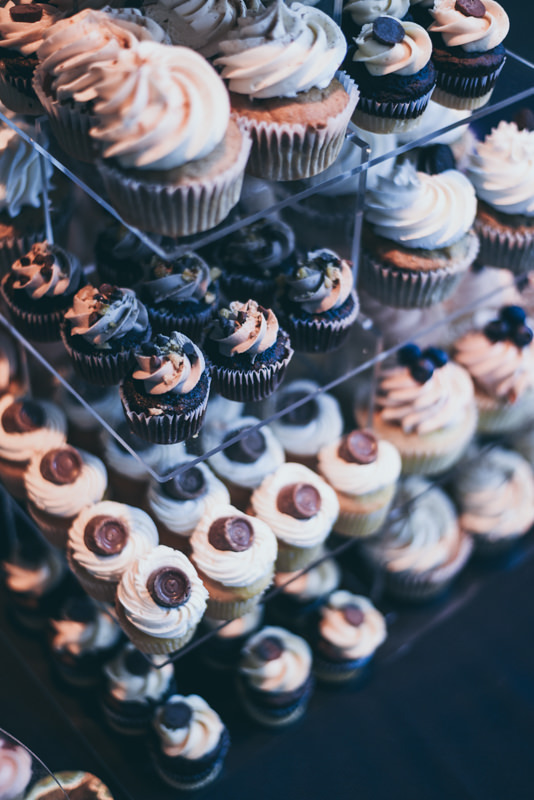 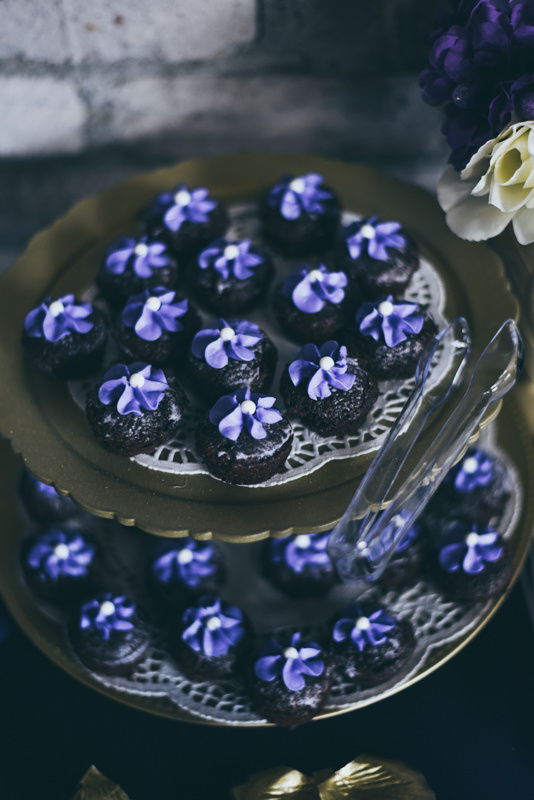 Distinctive Catering provided both the amazing buffet dinner and the bar service and Dreamscapes Desserts made delicious cupcakes and the bridal cake! 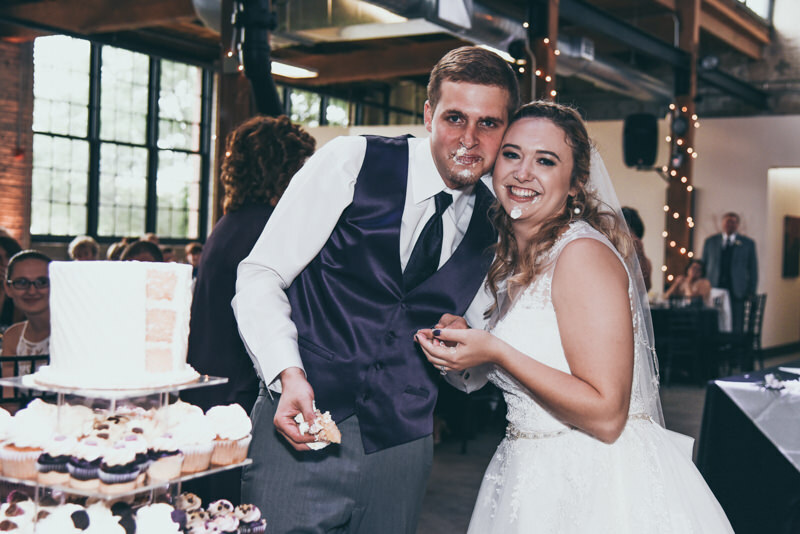 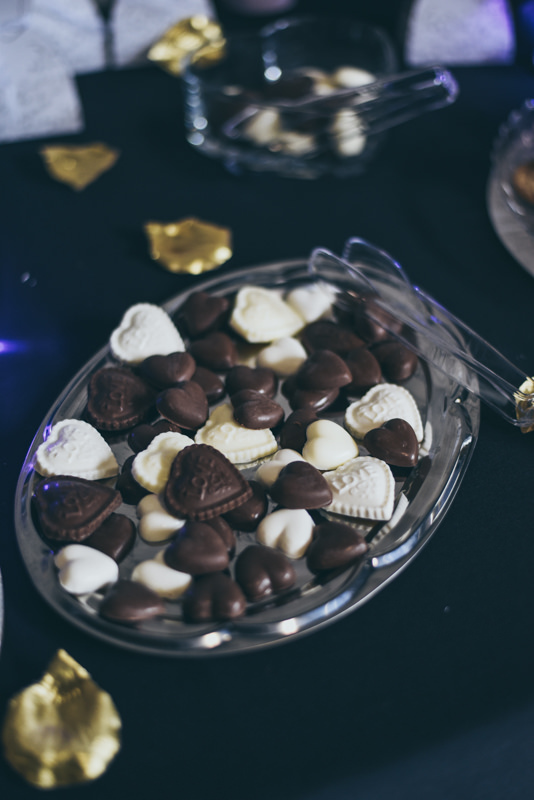 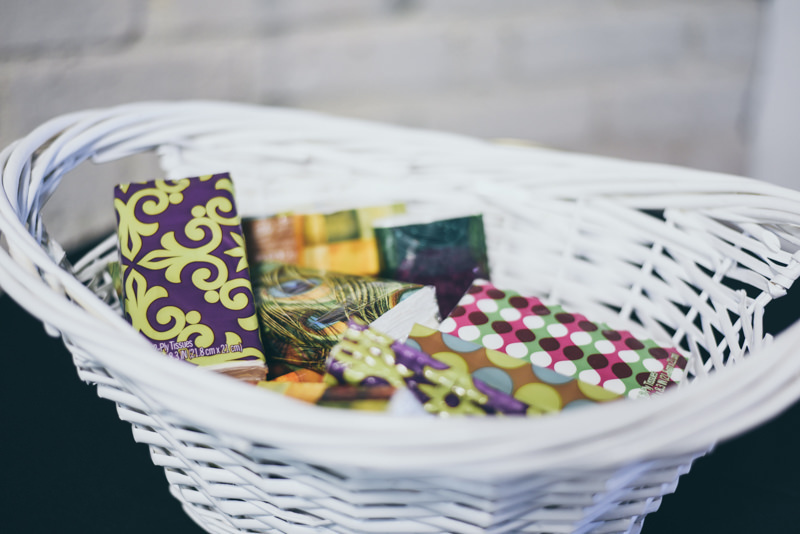 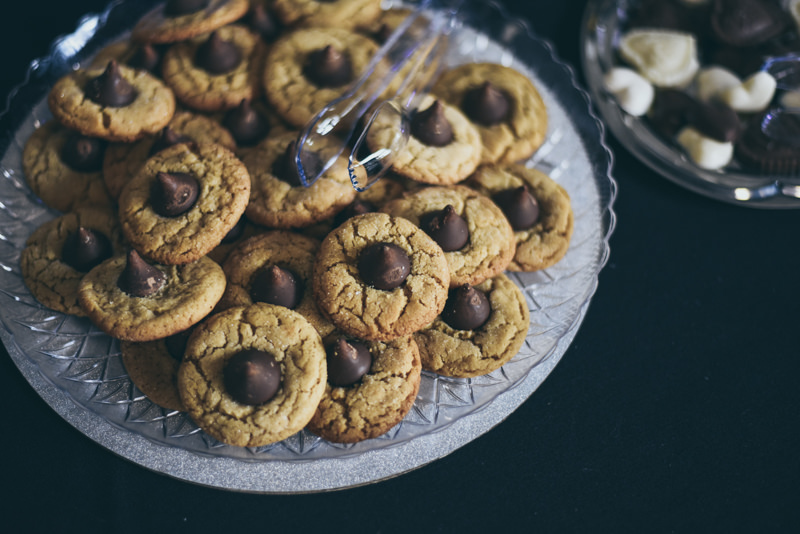 Claire and Geoff also came up with piles of home baked goodies and candies for their guests to enjoy! 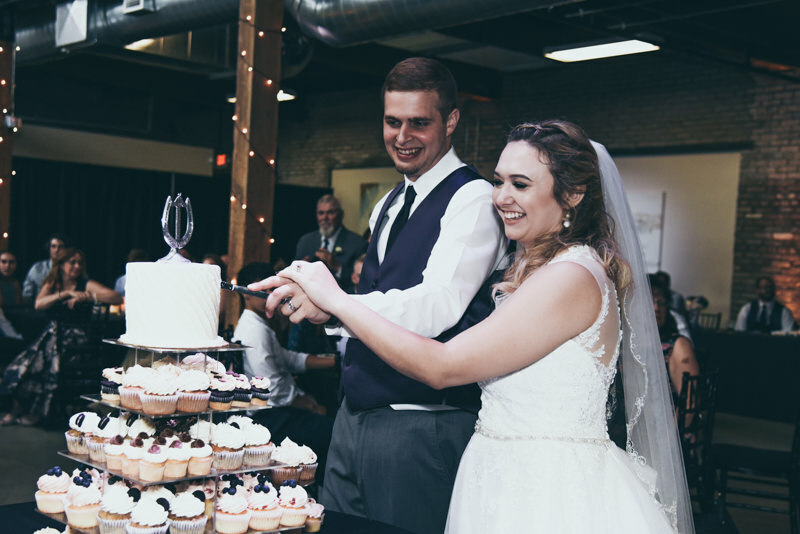 We topped it off with late night pizza around 9:30pm, and helped to keep the party going all night! 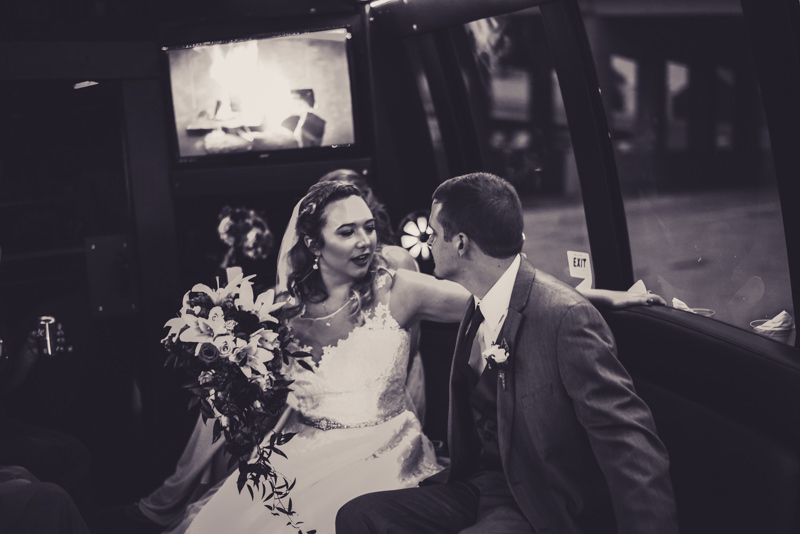 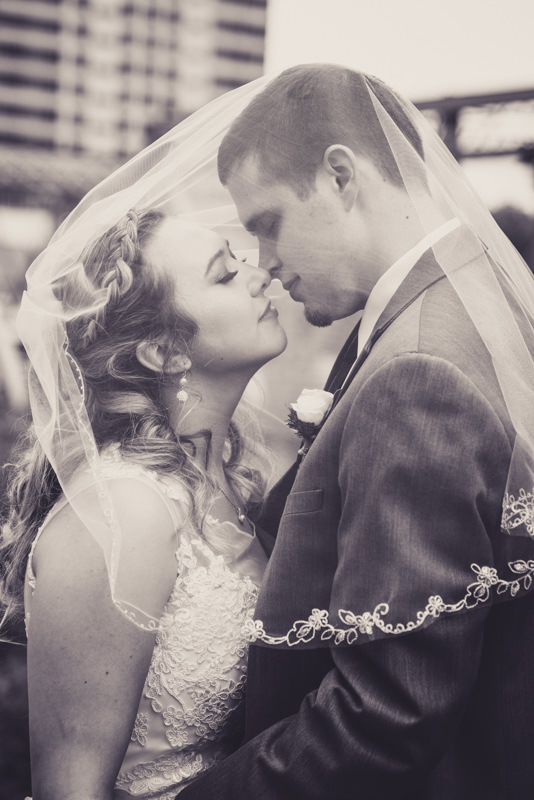 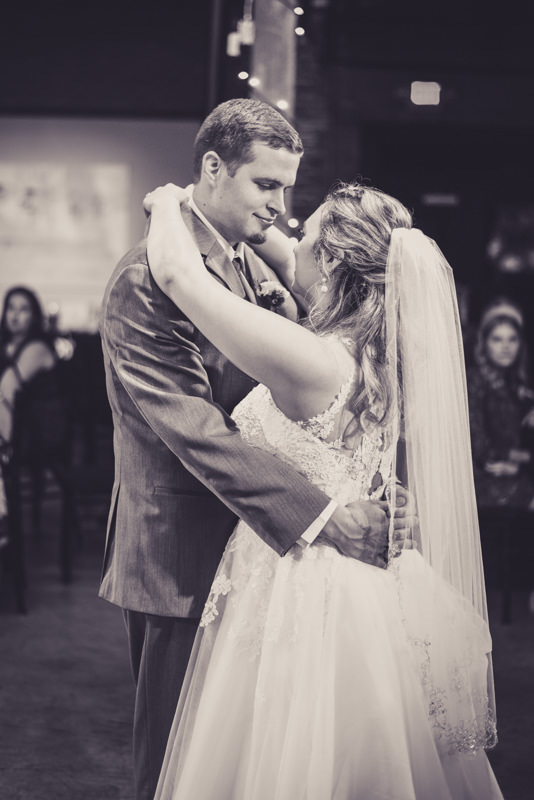 Geoff and Claire, we were so thankful to be a part of your wedding day!